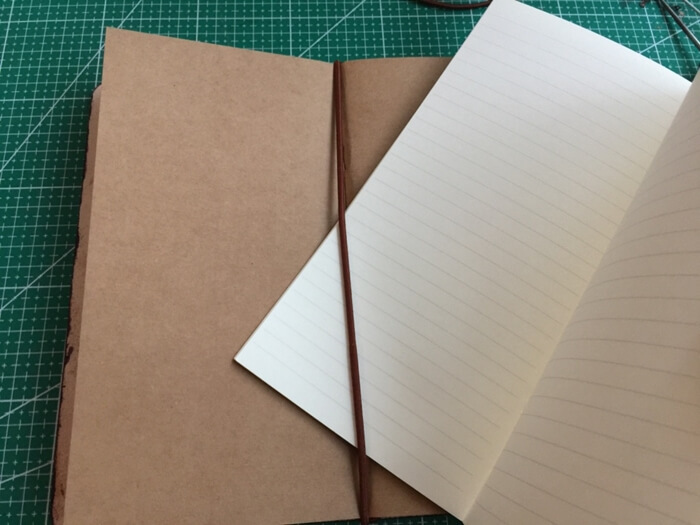 Midori Traveler’s Notebook is so popular recently, quality leather cover, refillable notebook inserts bounded by elastics, unique system that loved by many journal lovers and travelers. 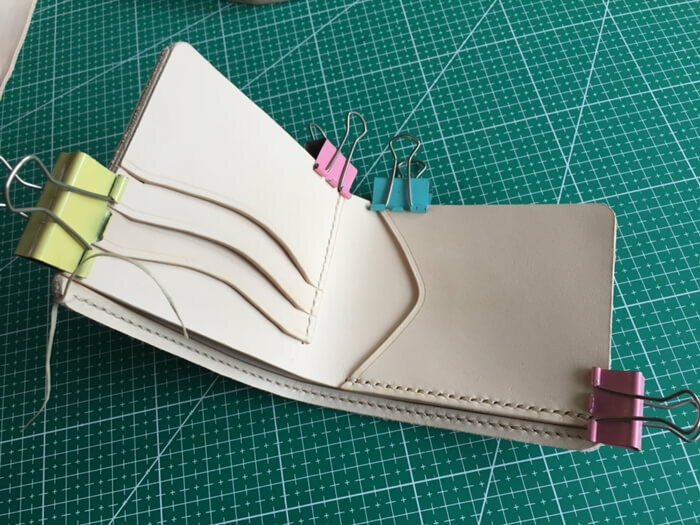 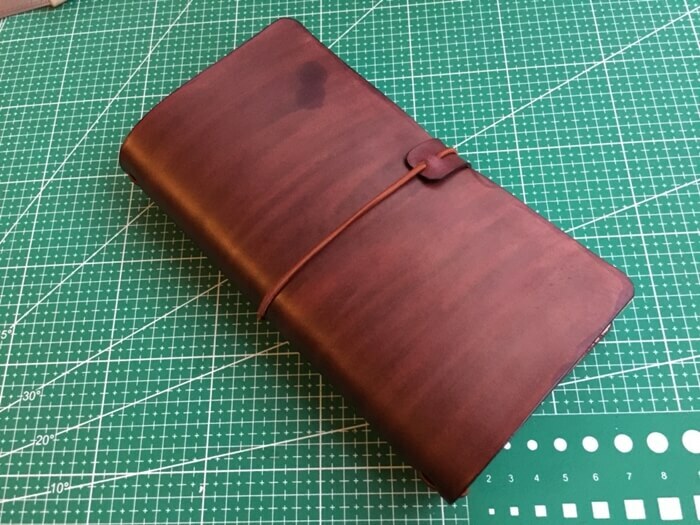 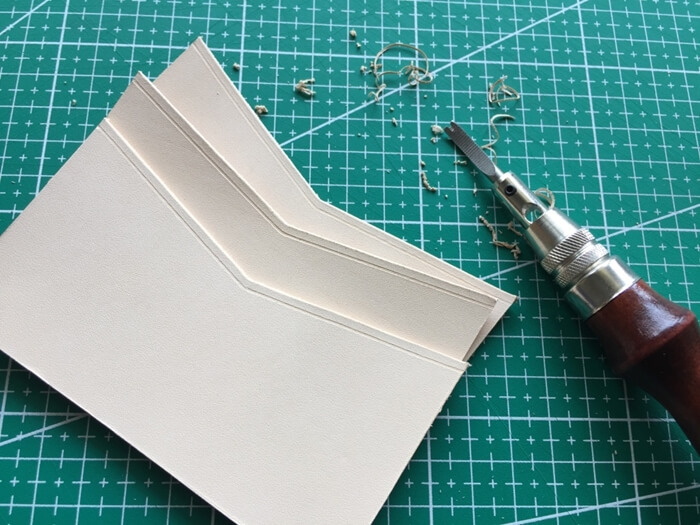 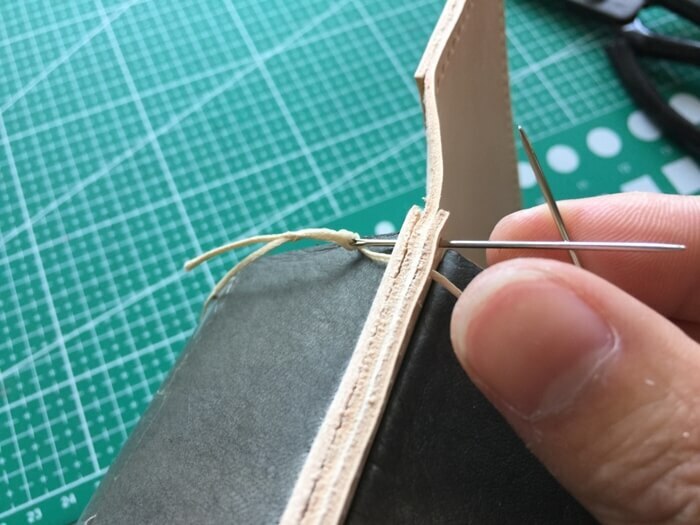 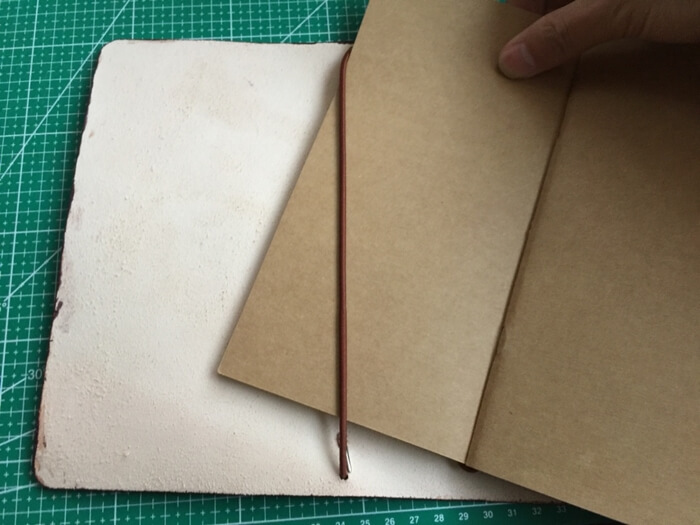 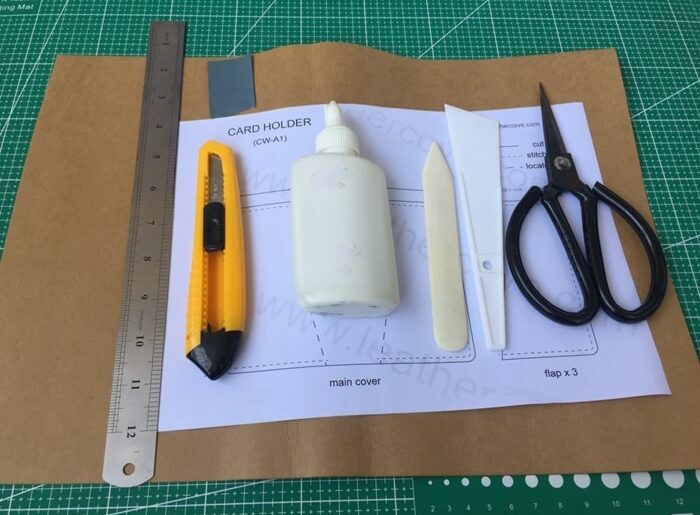 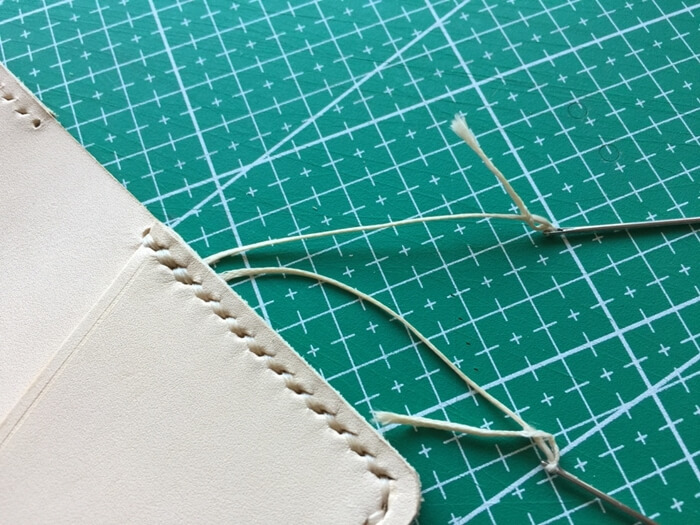 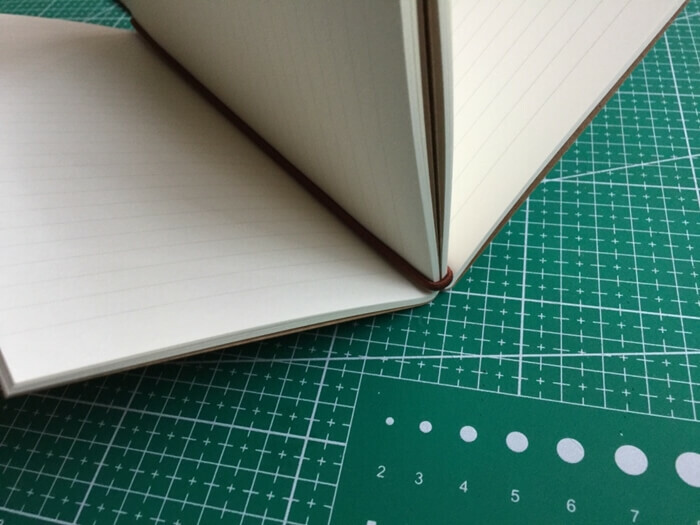 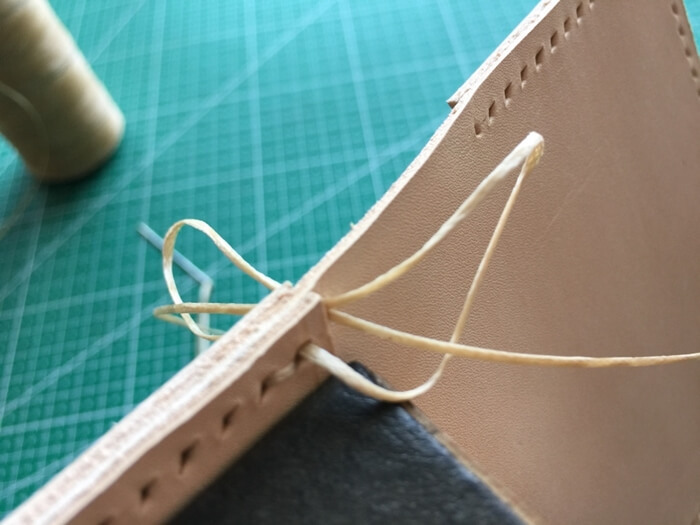 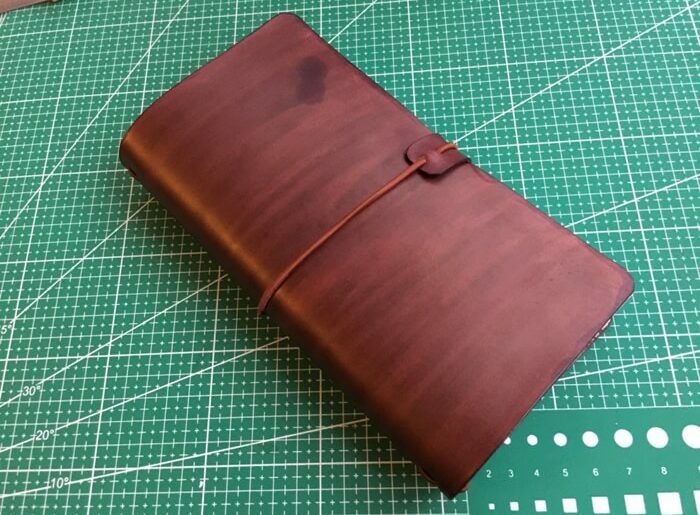 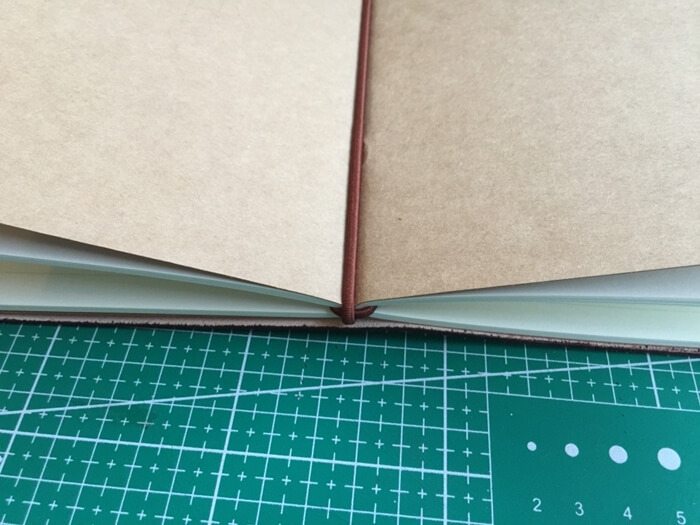 In this post, I will show you step by step to make a Midori style traveler’s notebook. 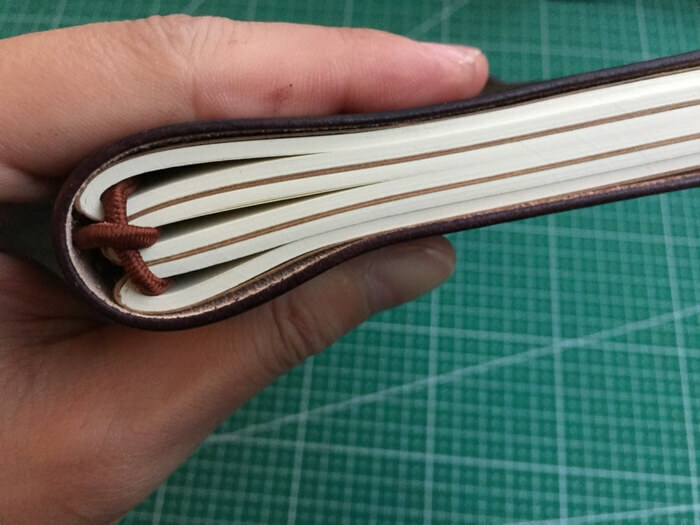 Midori Traveler’s Notebook haS 2 main sizes, standard 8.5 x 4.5 inches and passport size. 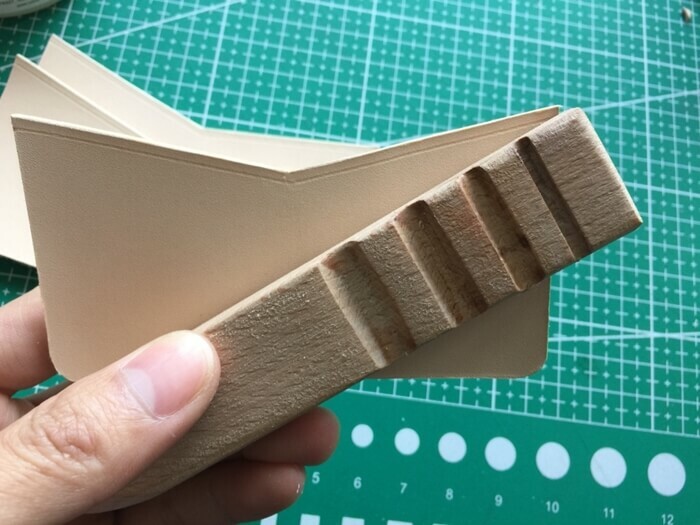 Here I am going to make a standard one. 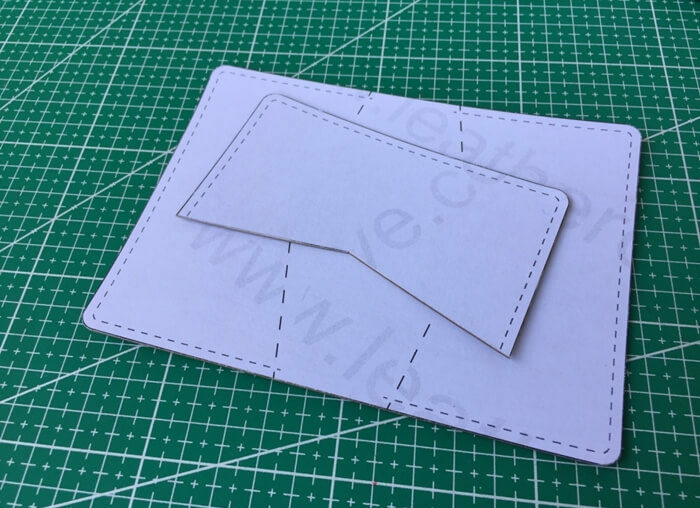 The insert is 21 x 11cm, so I made the template with 25 x 22cm so it could hold the inserts. 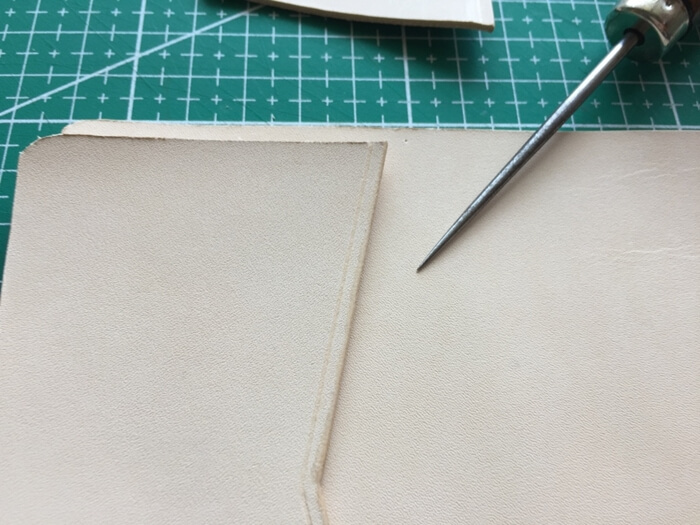 Mark cut lines onto the leather. 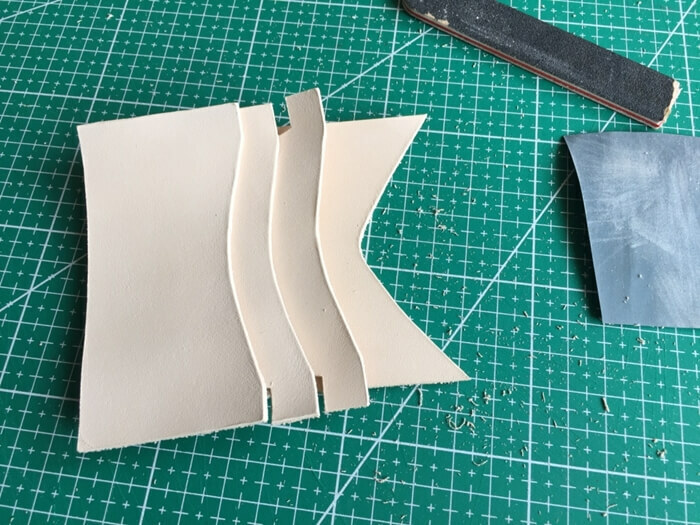 Cut round corns by using a stuff with a rounded edge. 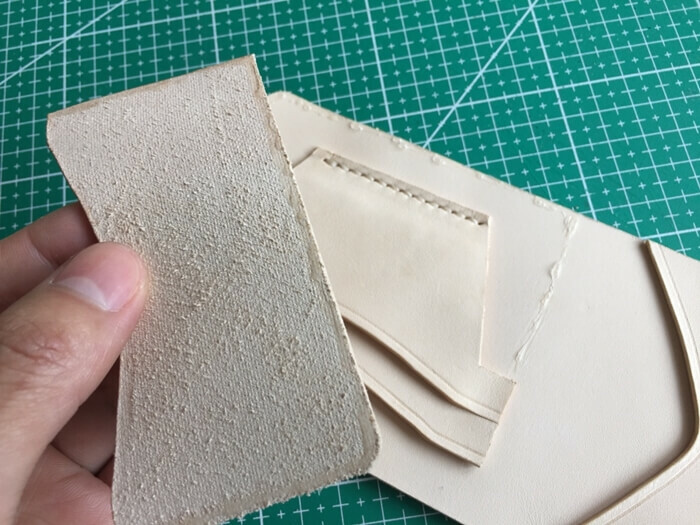 The leather used is natural vegetable tanned leather, here I am going to dye it in dark brown. 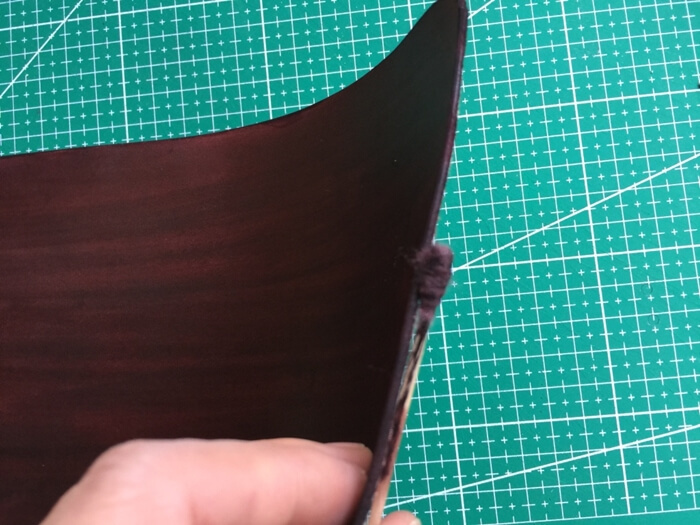 Trimming the edge and dye it in dark brown. 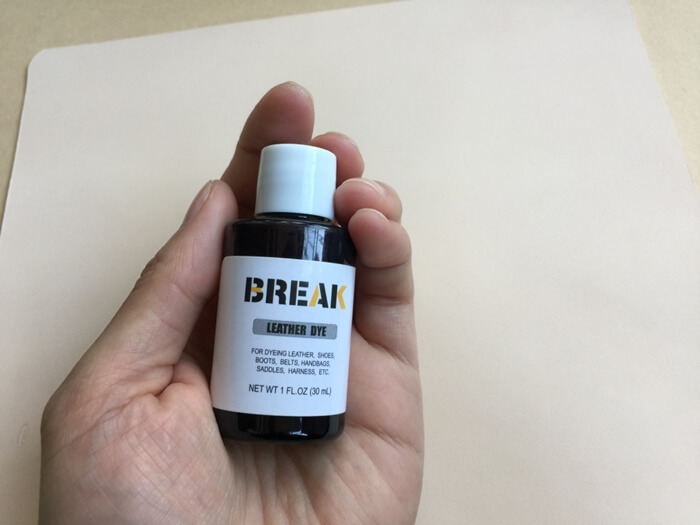 Apply edge finish gel and polish to bright. 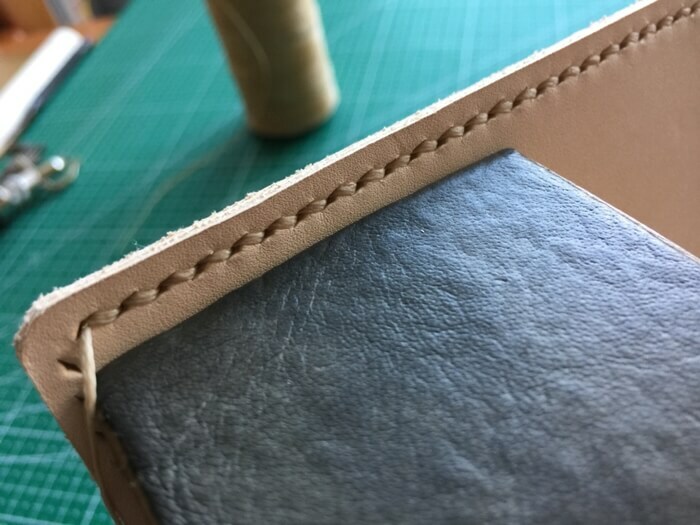 The leather is a little thin (about 1.8mm thick), to protect the cover from the elastic band, I decide do add a leather patch. 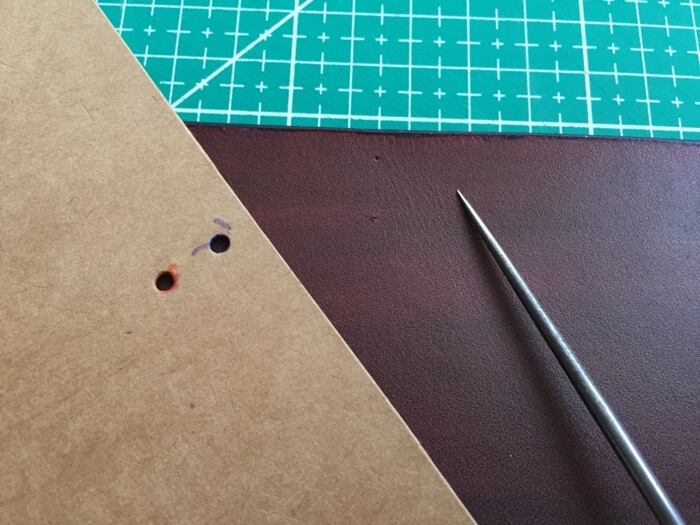 mark and punch holes onto the cover. 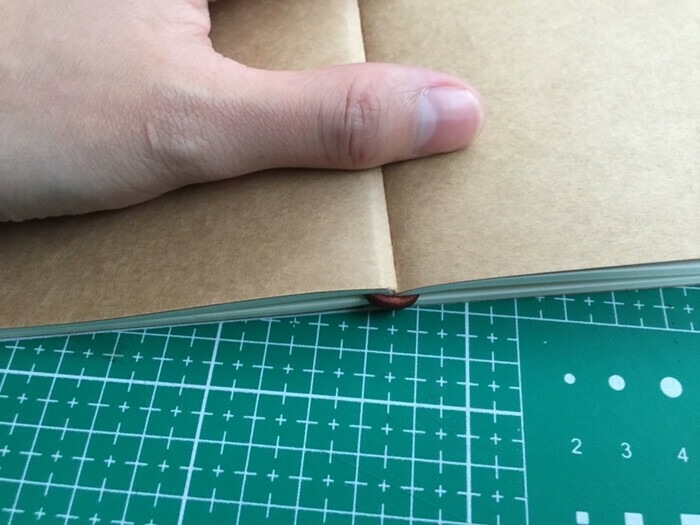 One of places of the original Midori TN people complaining is the elastic knot inside the back of the cover will interfere when writing. 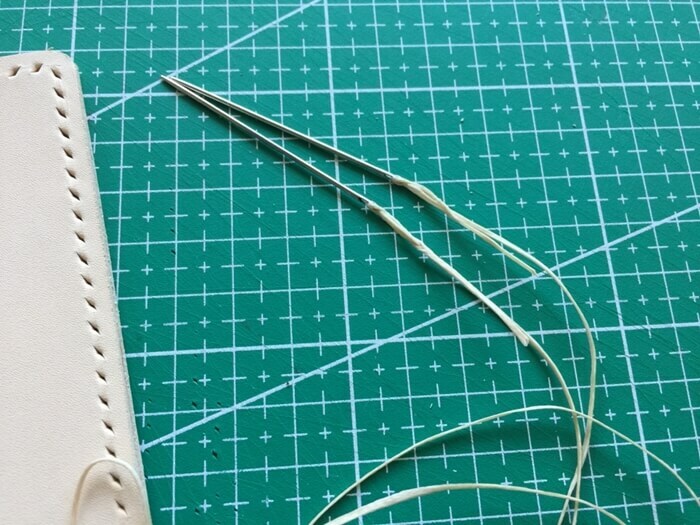 So here I use metal clips. 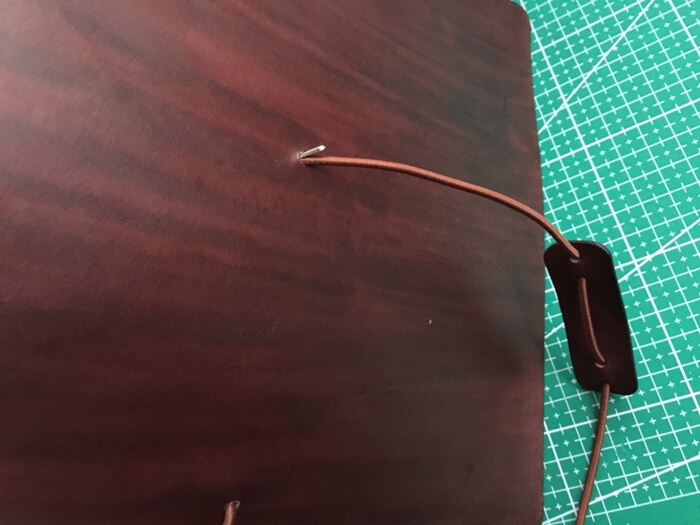 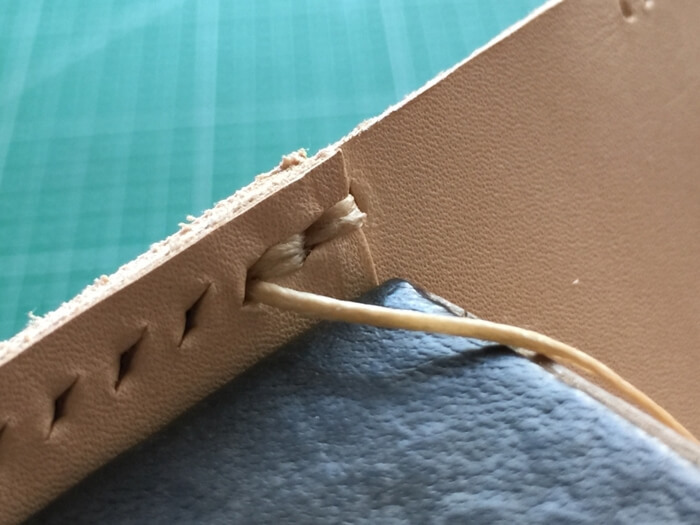 Insert the elastic rope into the top hole from the flesh side of the cover. 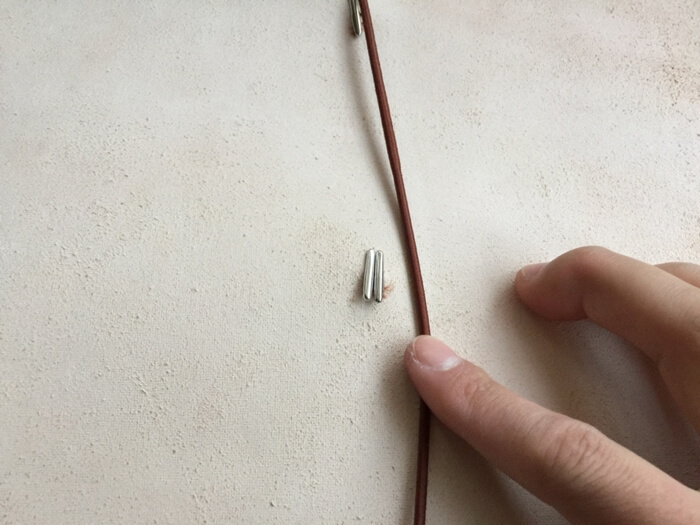 Insert back from the second hole. 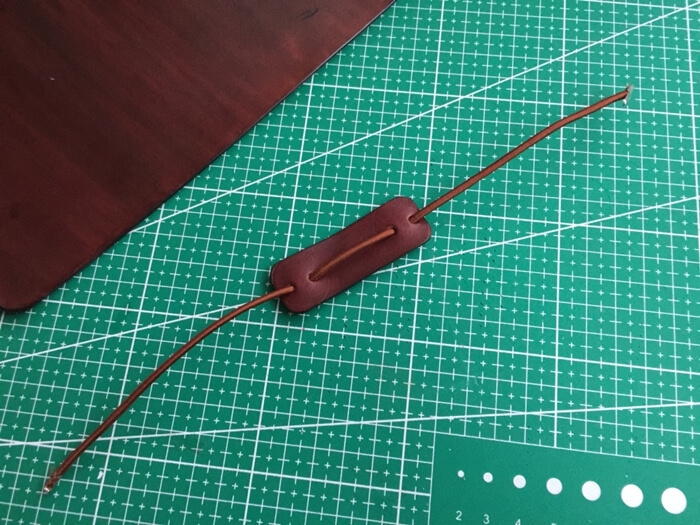 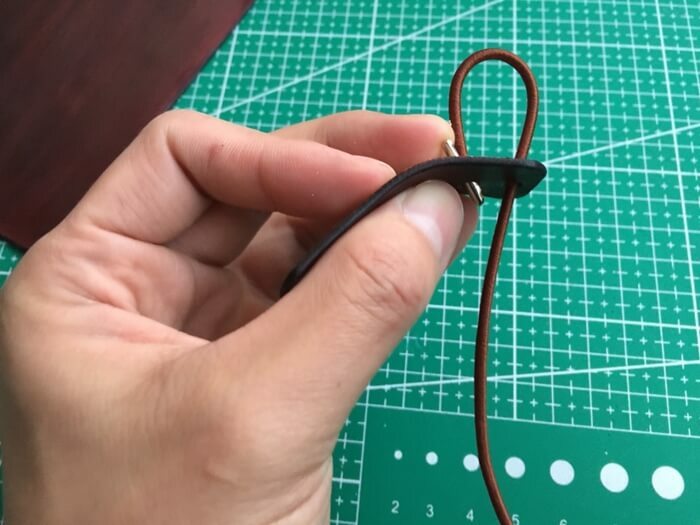 Pull the elastic to keep the clip end tight onto the cover. 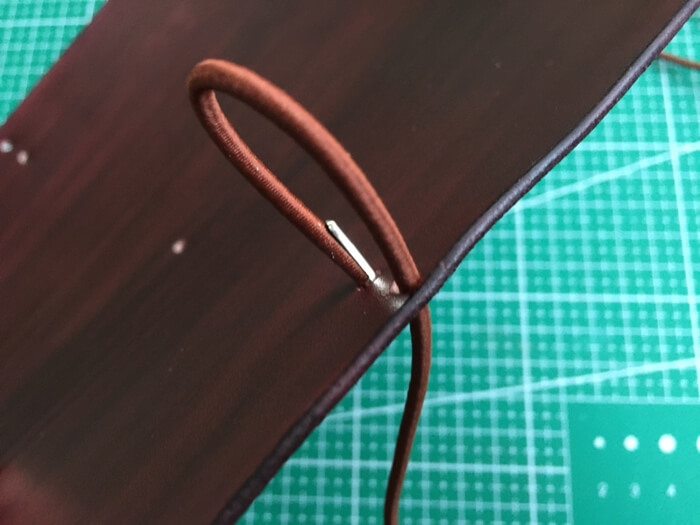 Use the same way to install the other side. 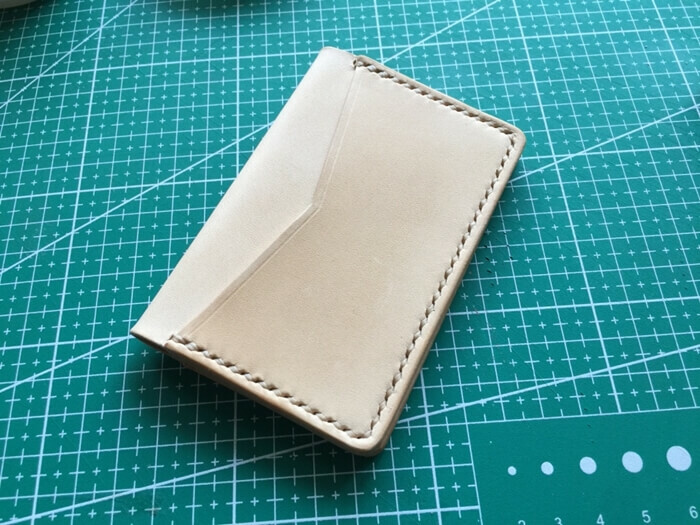 Here is how it looks . 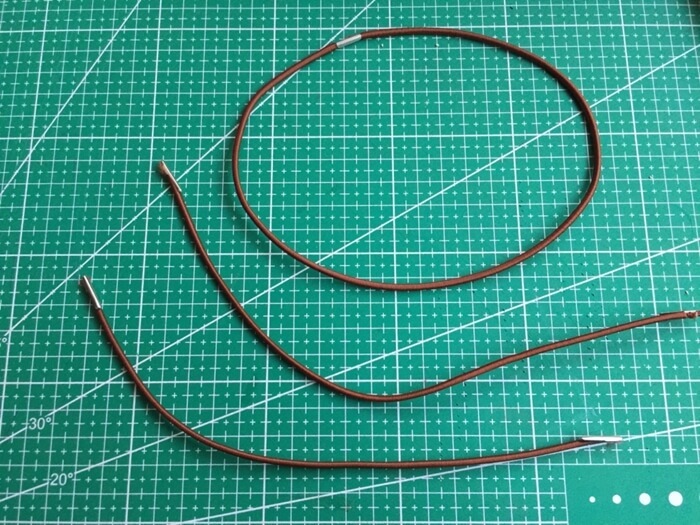 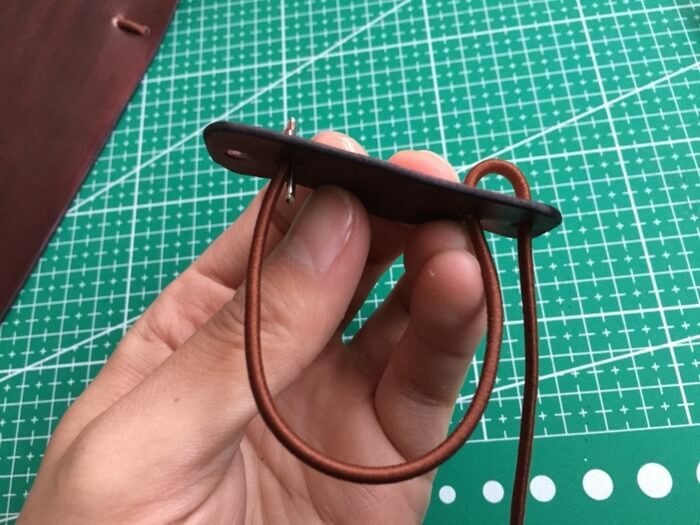 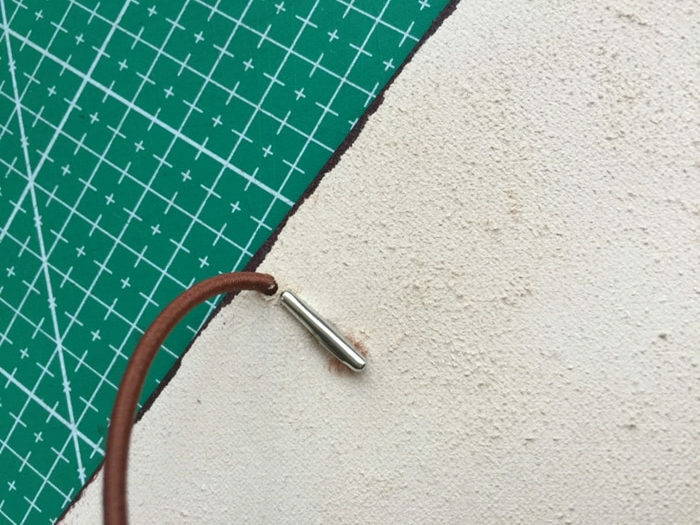 Install the leather patch with another elastic rope. 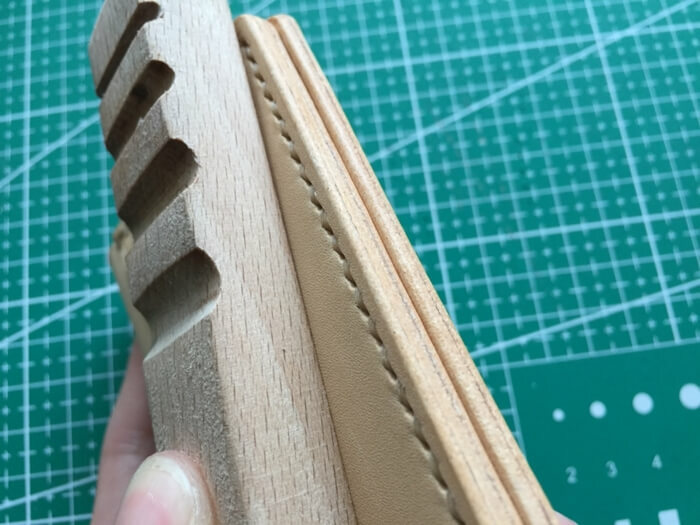 Insert both clip ends into the central hole and keep tight. 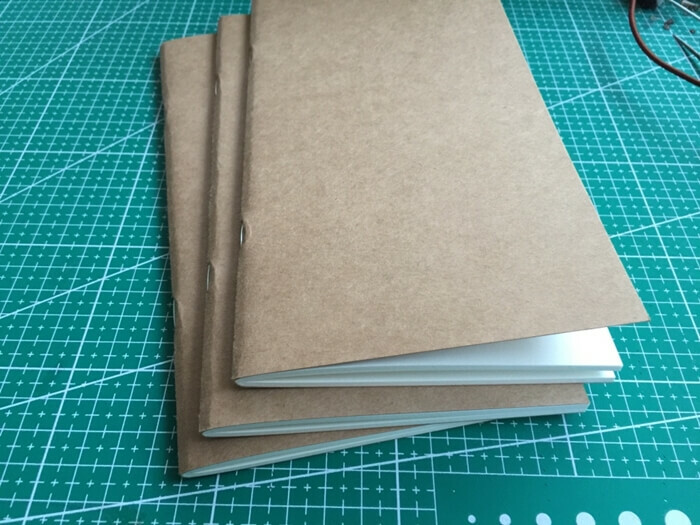 3 notebook inserts, standard 21 x 11cm. 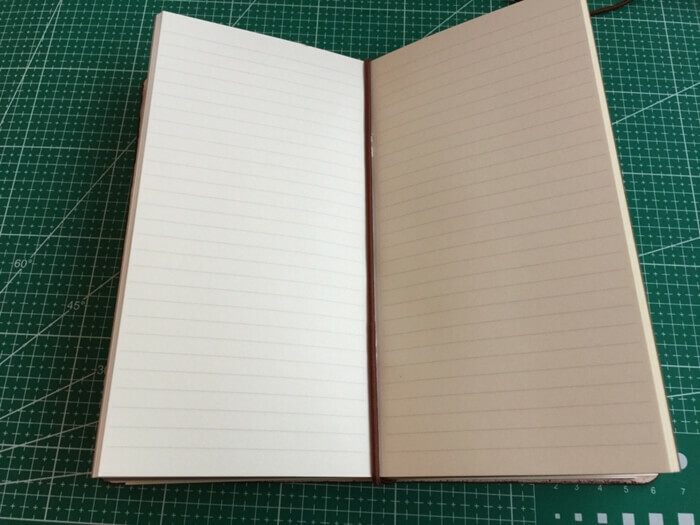 Open 2 of the notebooks . 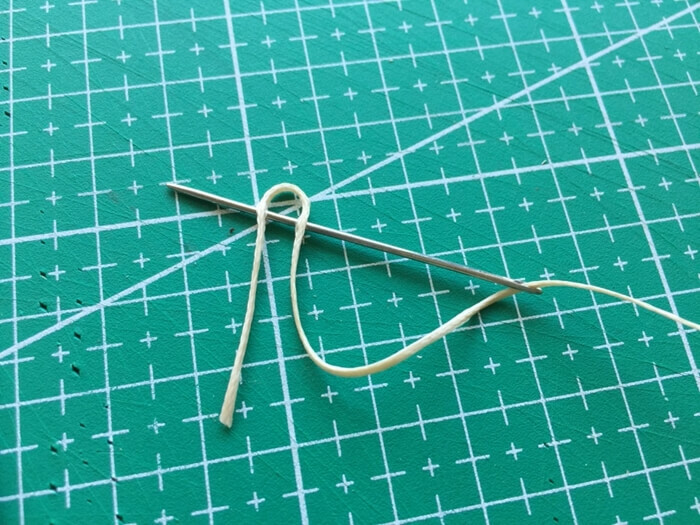 Connect them with the elastic loop. 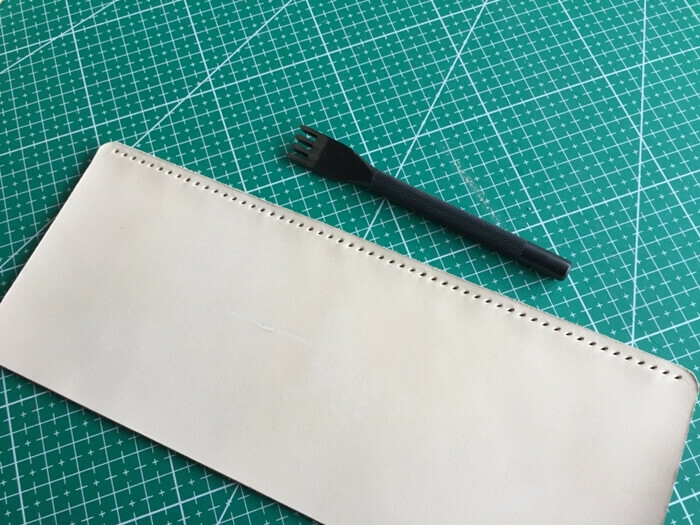 Insert the notebooks under the elastic. 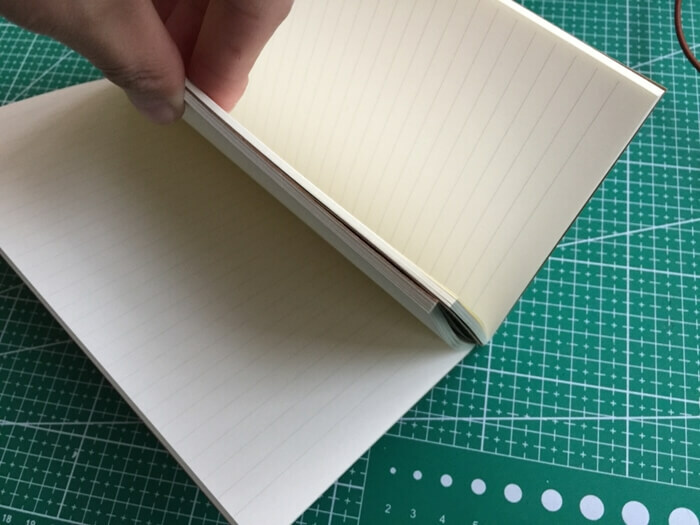 Insert the 3rd notebook under the same elastic. 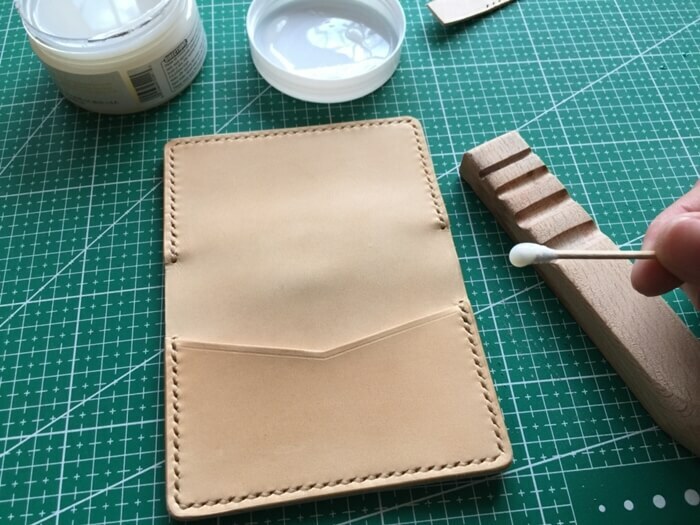 Want to make yours? 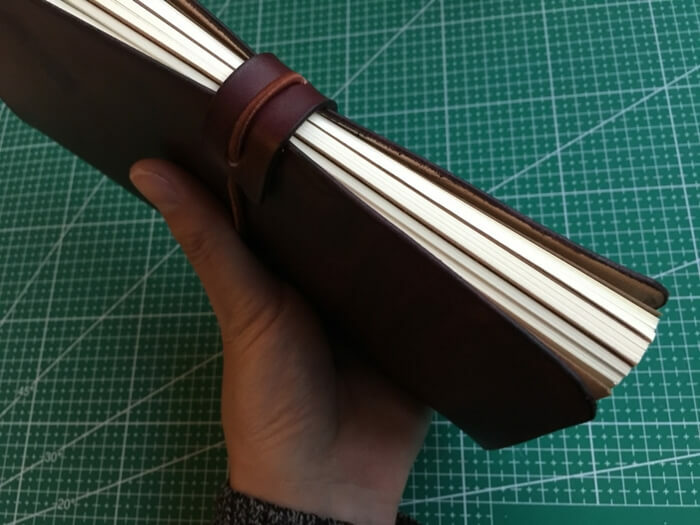 Be sure download the traveler’s notebook pattern before you go. 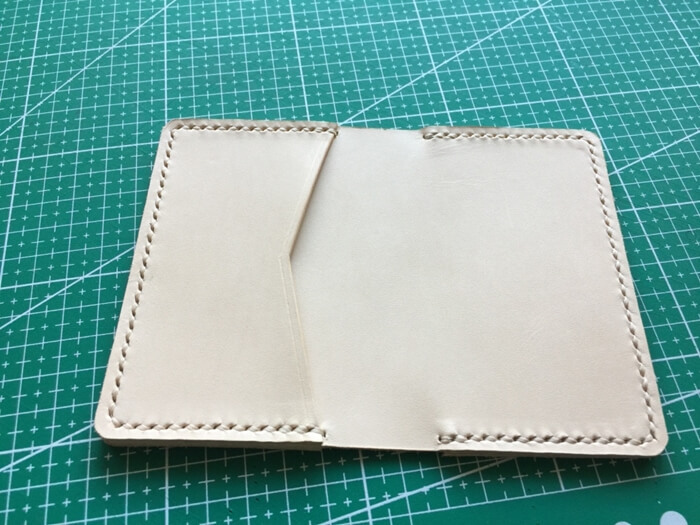 4 years ago, when I started to learn leather crafting, the first item I made is this leather wallet. 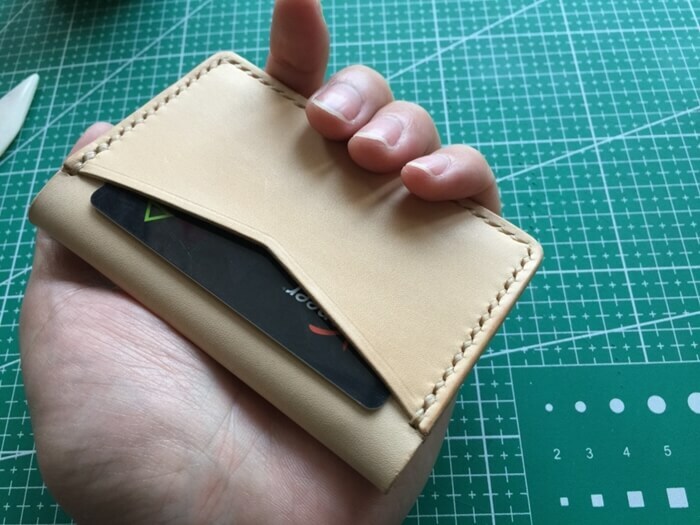 Today I am still using that wallet. 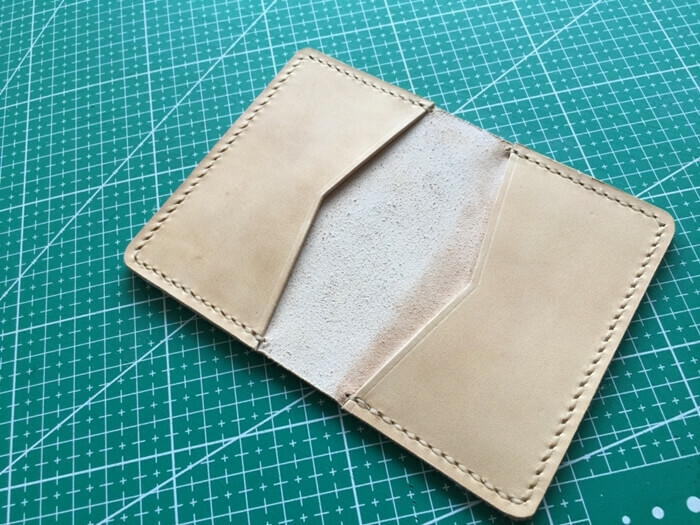 You can see how it looks now. 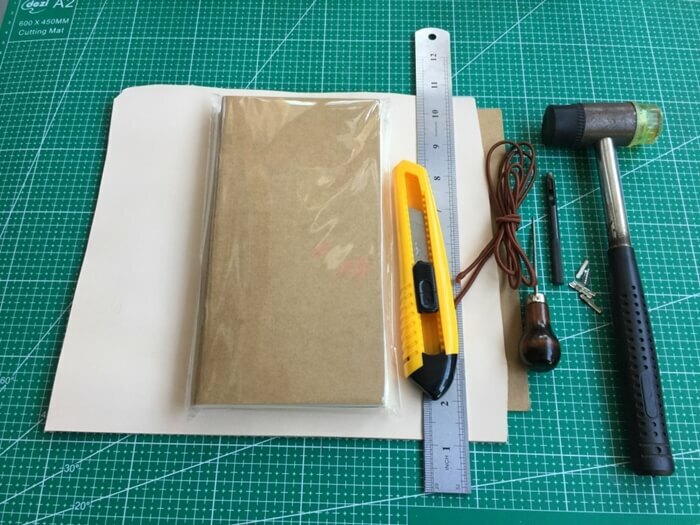 Tools and supplies for this project. 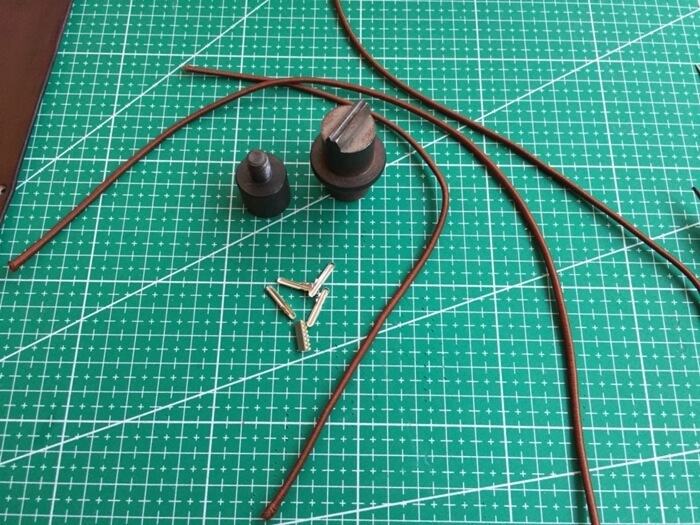 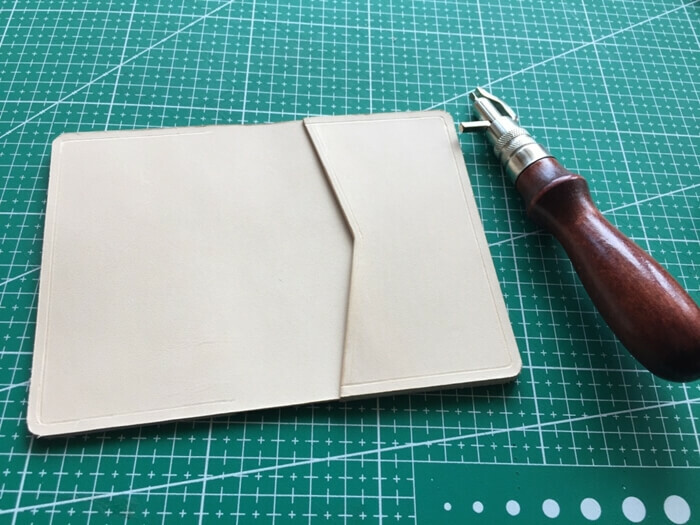 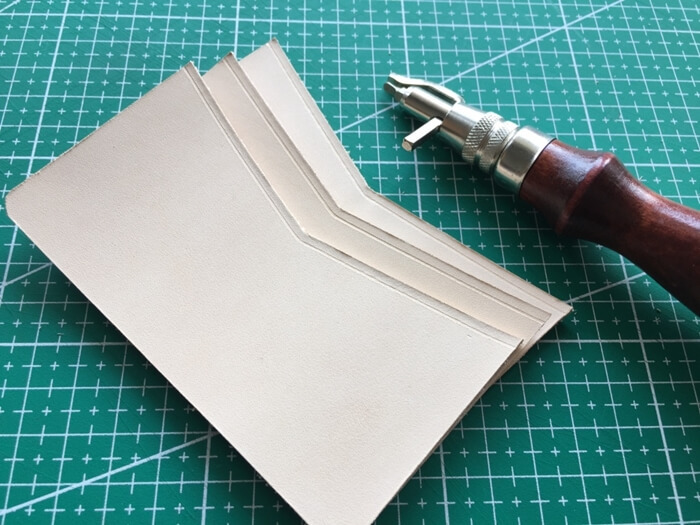 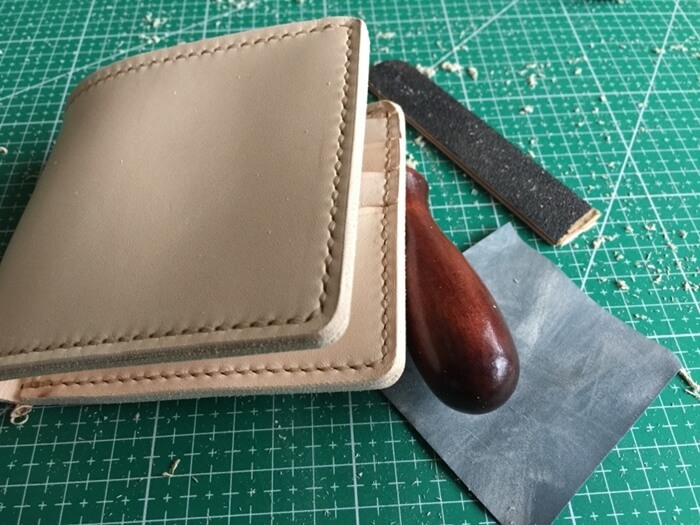 First mark cut lines with leather template, I am using vegetable tanned leather, so mark with an awl not silver pencil. 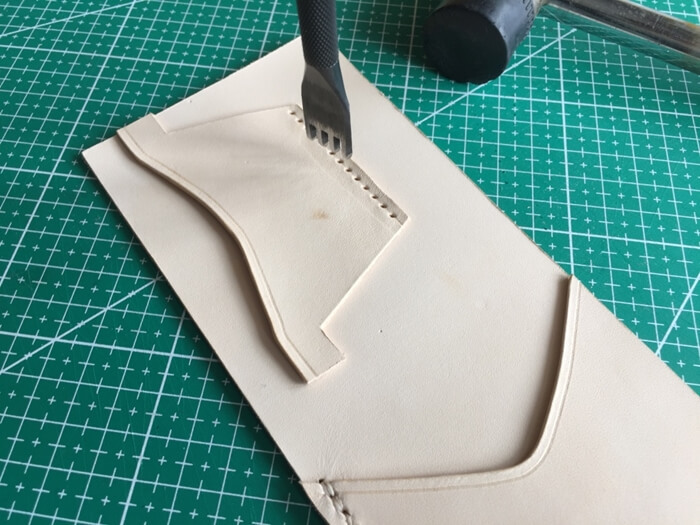 Cut out the leather pieces with skiving knife, cutter and scissors. 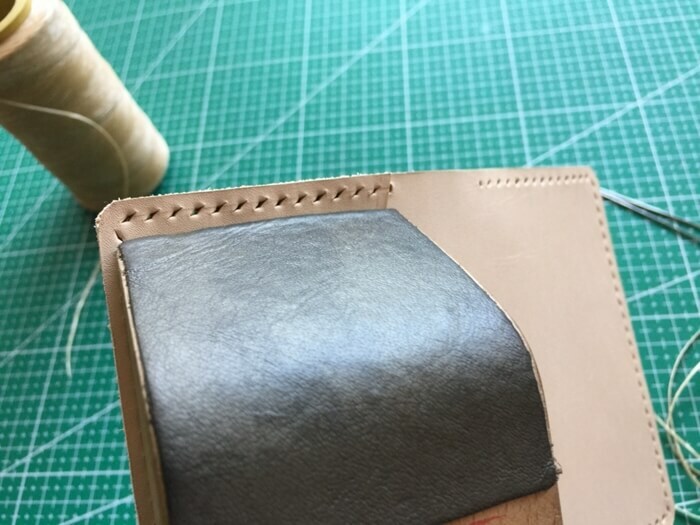 Apply leather finish gel on the edges. 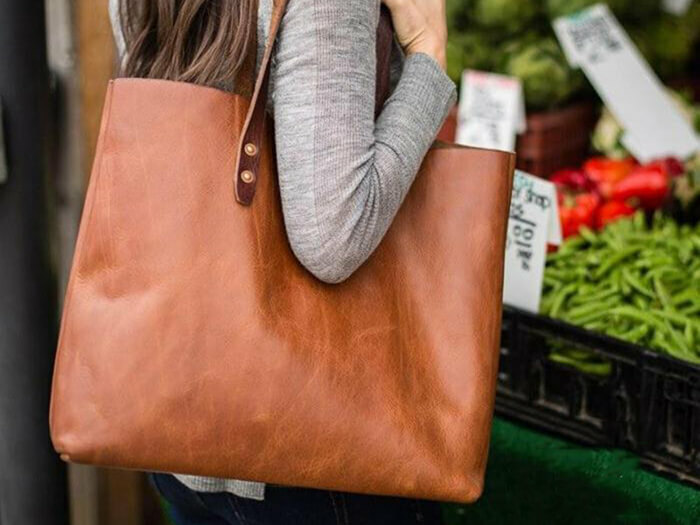 Polish to bright with a wood slicker. 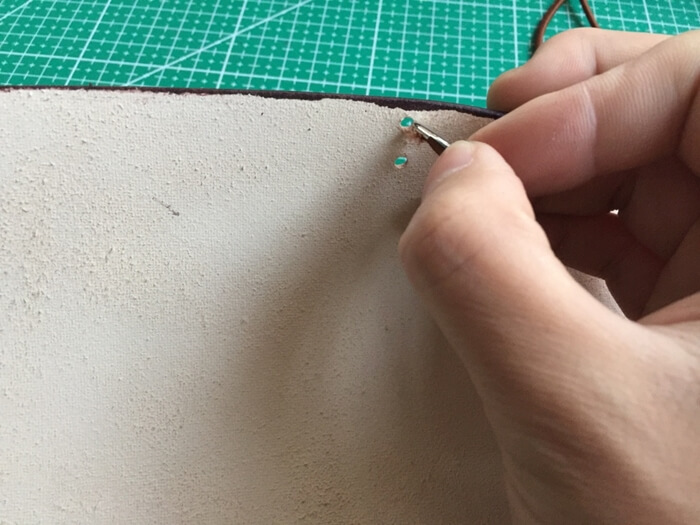 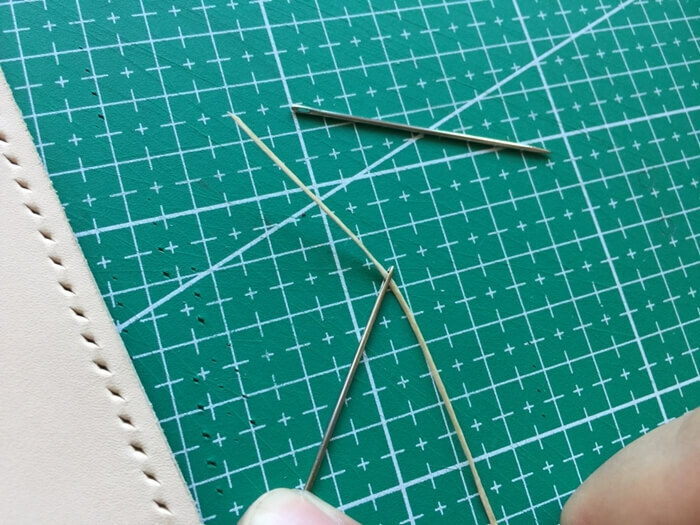 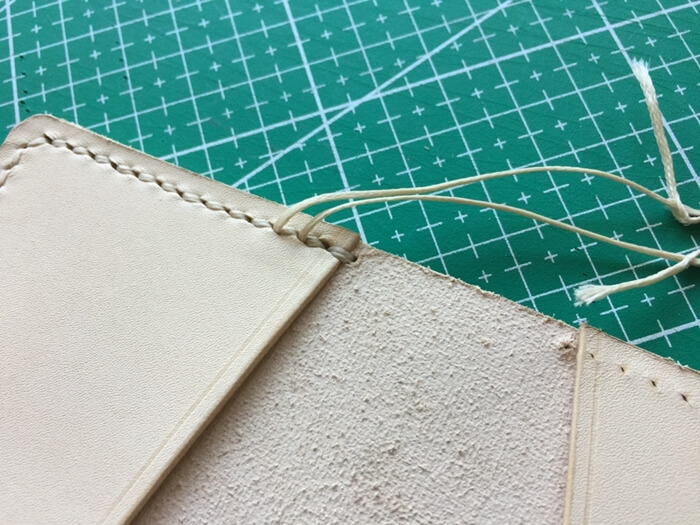 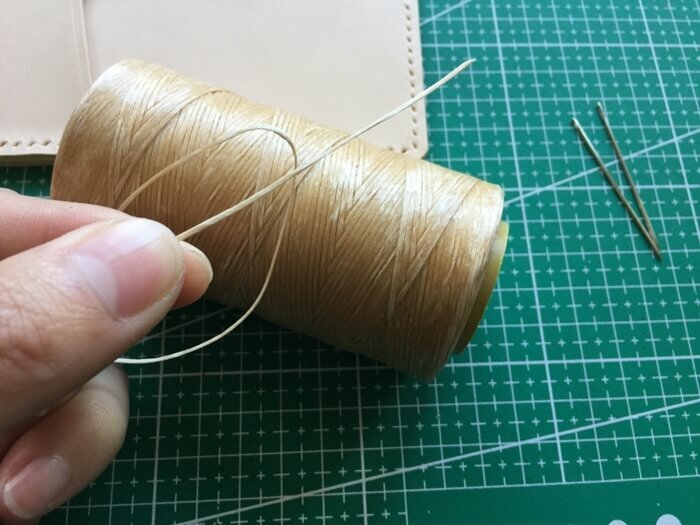 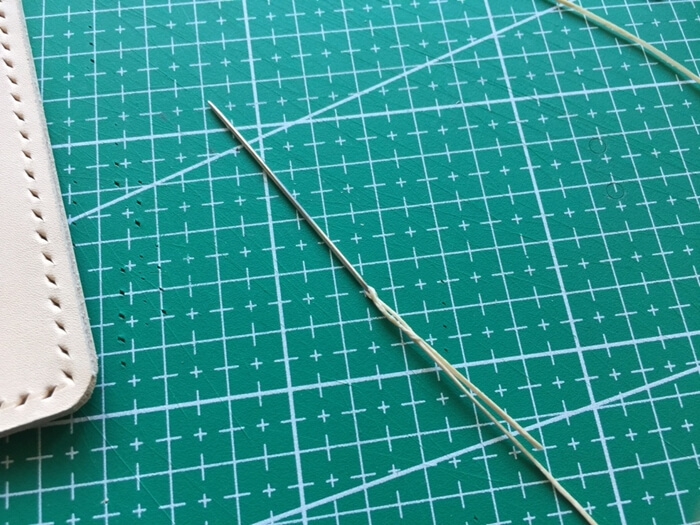 When the glue dry, make stitching line on the top with an edge creaser. 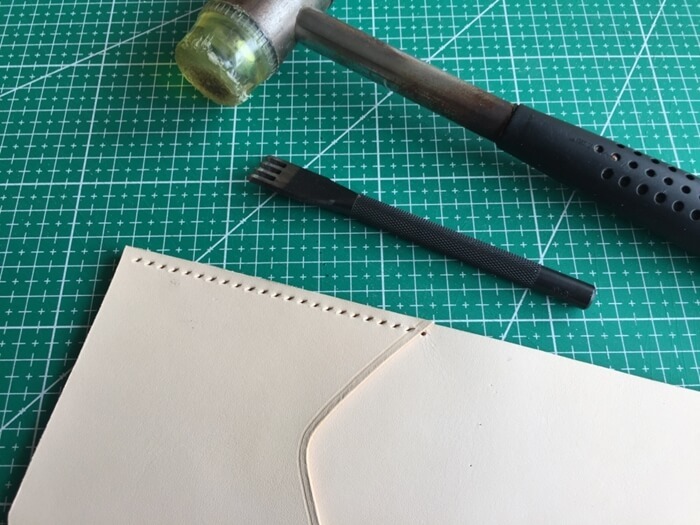 Punch holes with diamond chise and hammer. 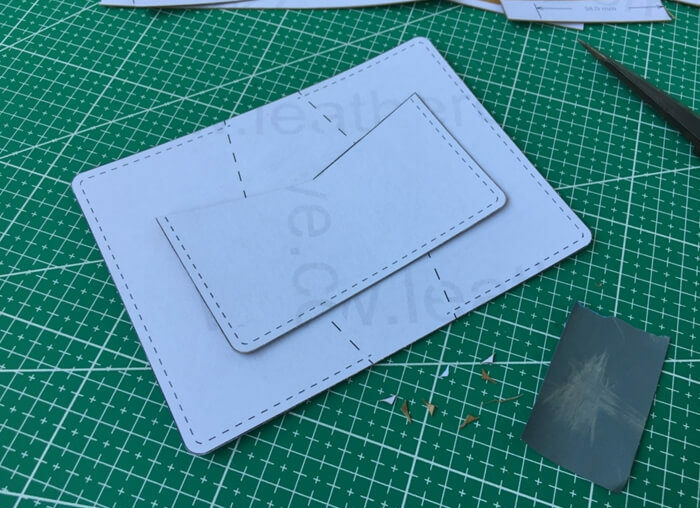 Make marks for the card slots. 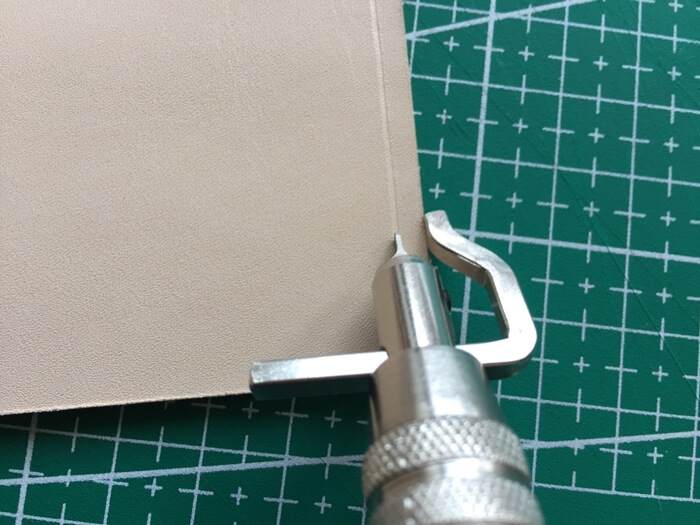 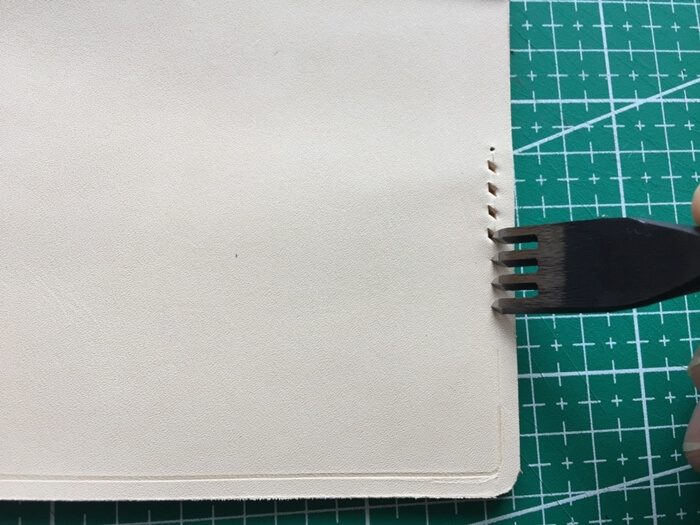 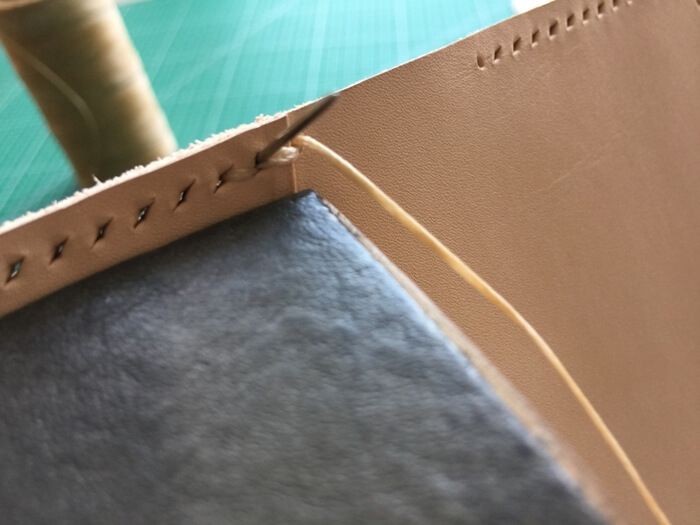 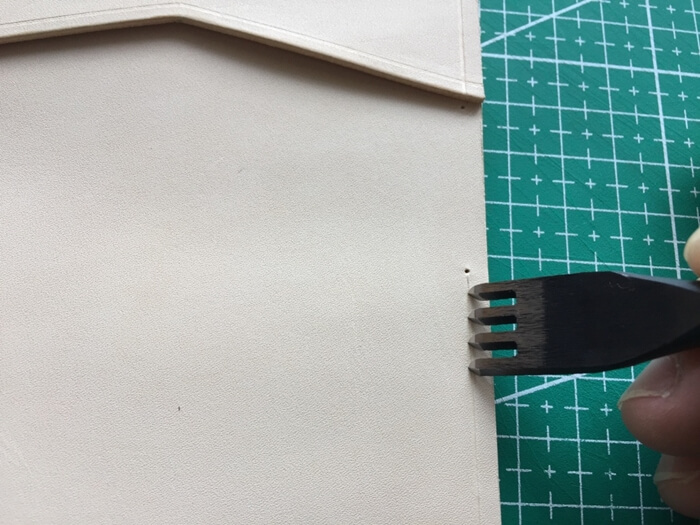 The leather is about 1.5mm thick, so thinning the flaps with a thinning tool. 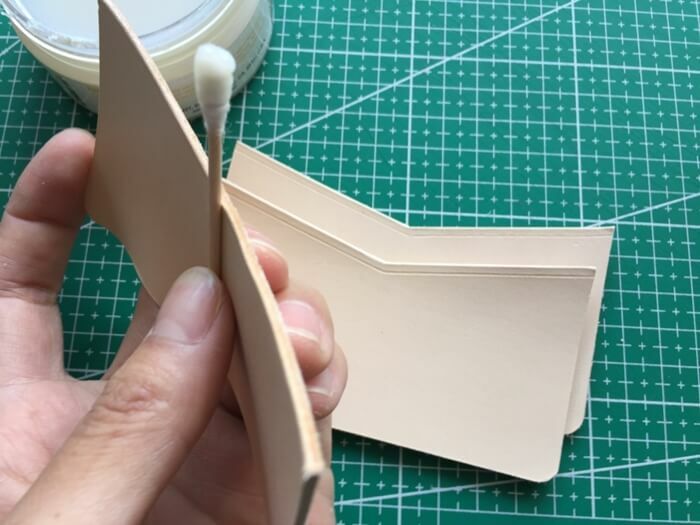 Glue the top card slot onto the inner cover. 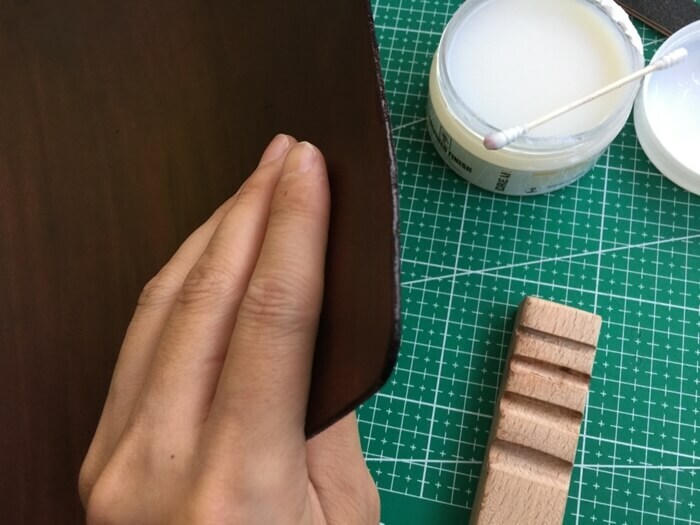 Polish the top edge with polish stick and sandpaper. 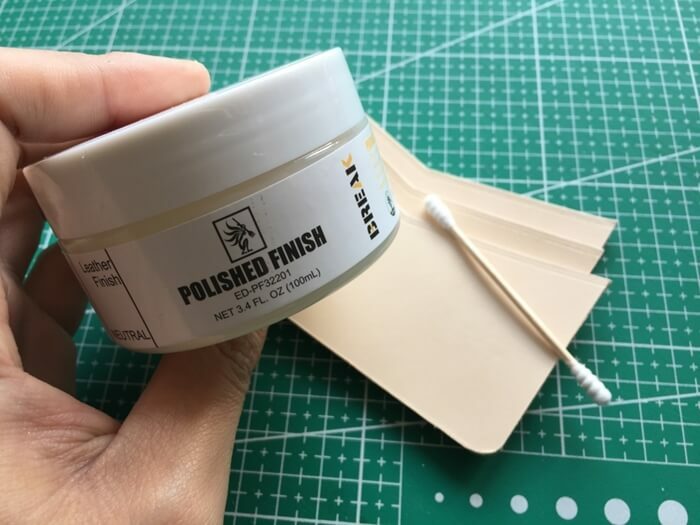 Apply finish gel and polish to bright. 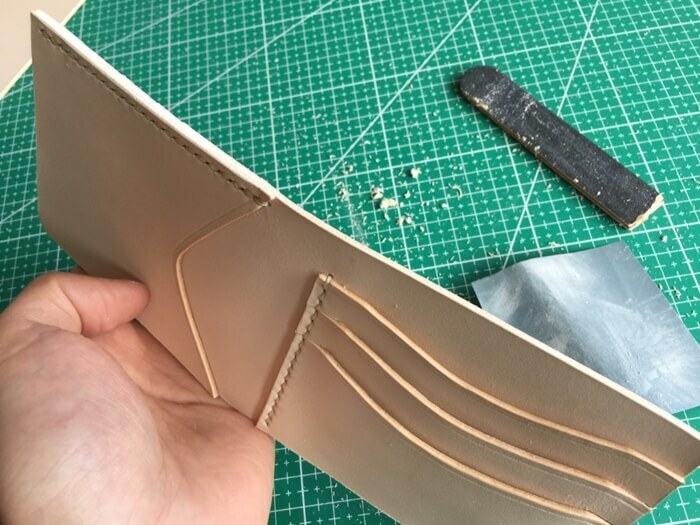 For now the inner part is ready. 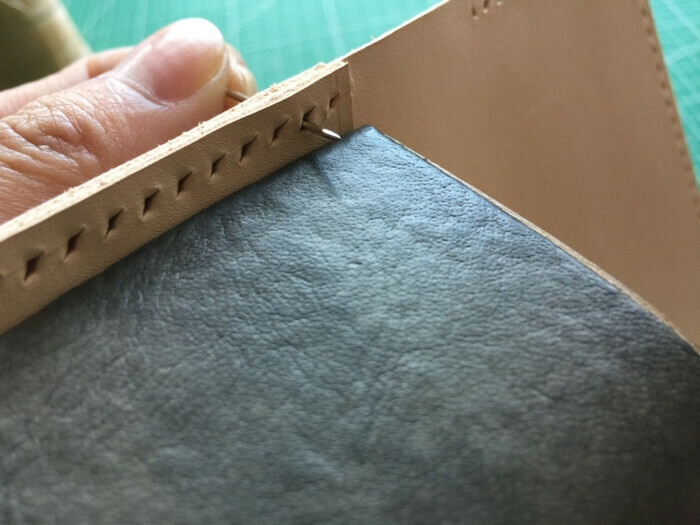 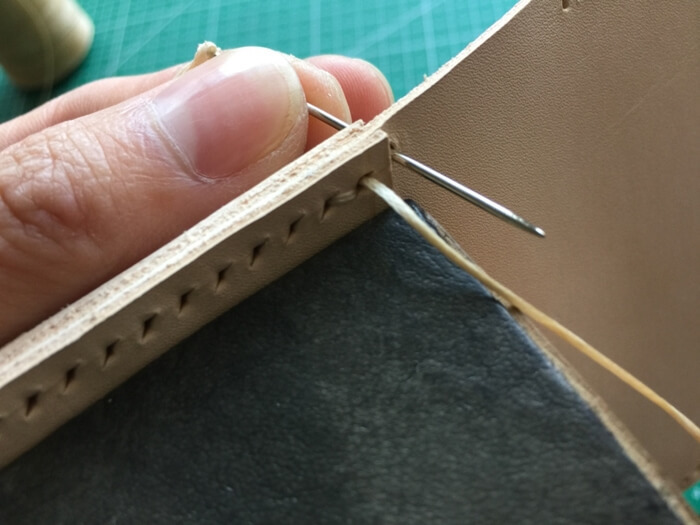 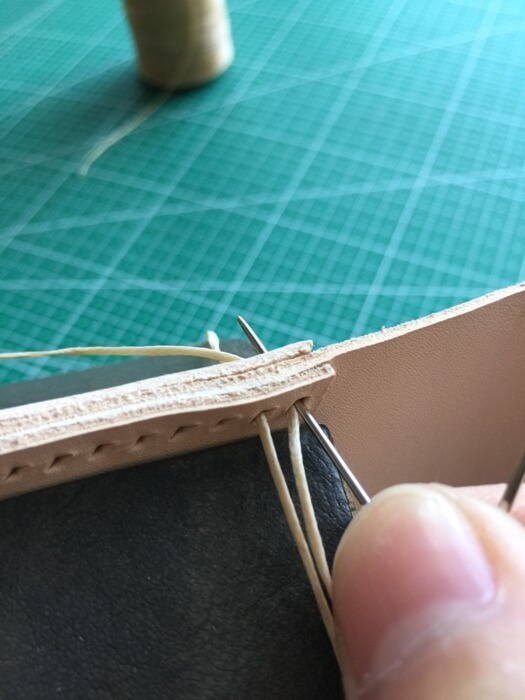 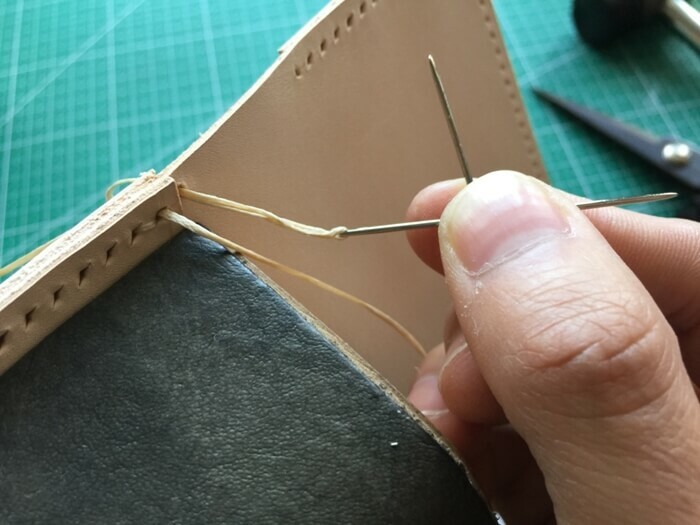 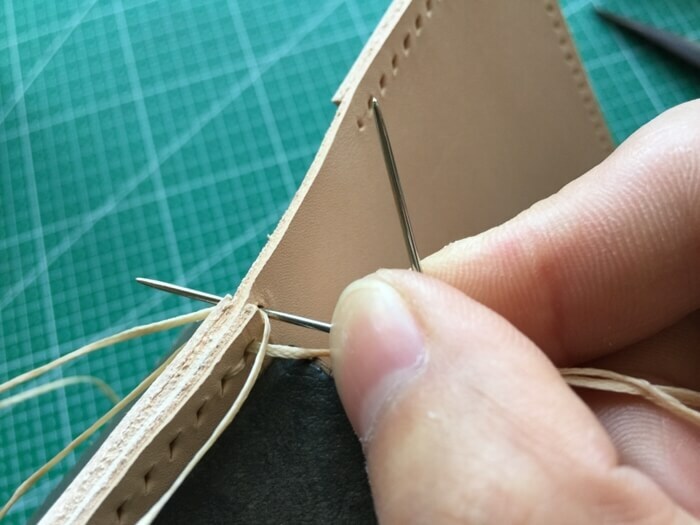 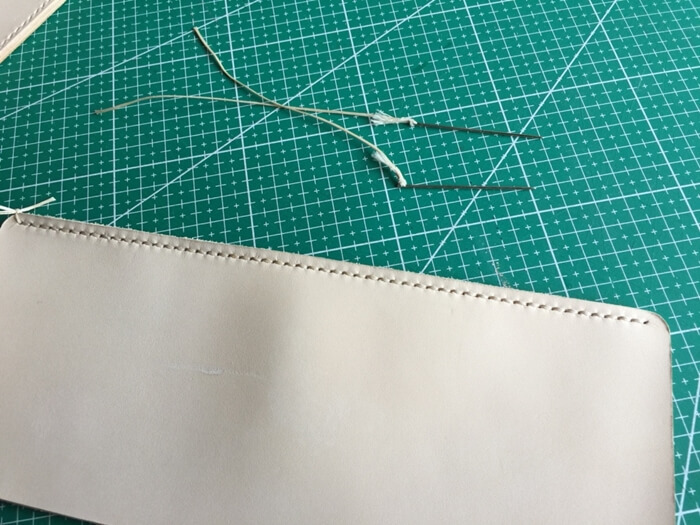 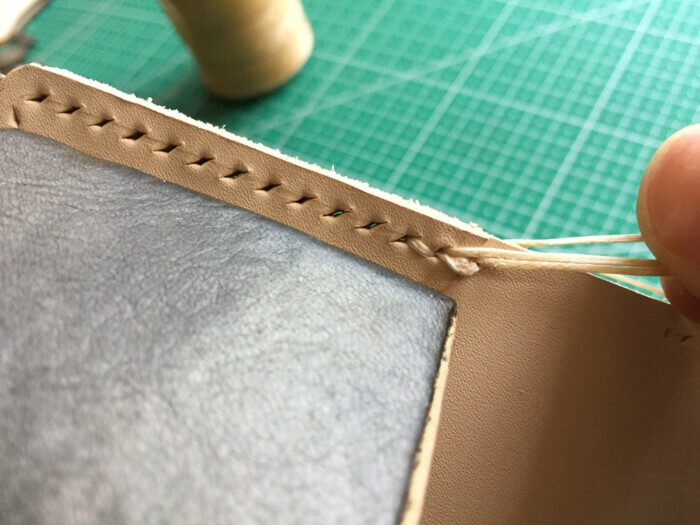 Polish the bottom edge of the top leather flap. 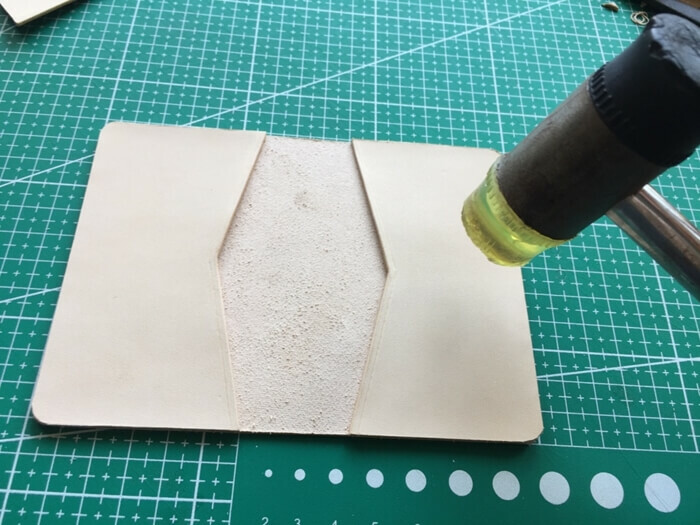 Glue it onto the top of the flesh side (rough side) of the main cover. 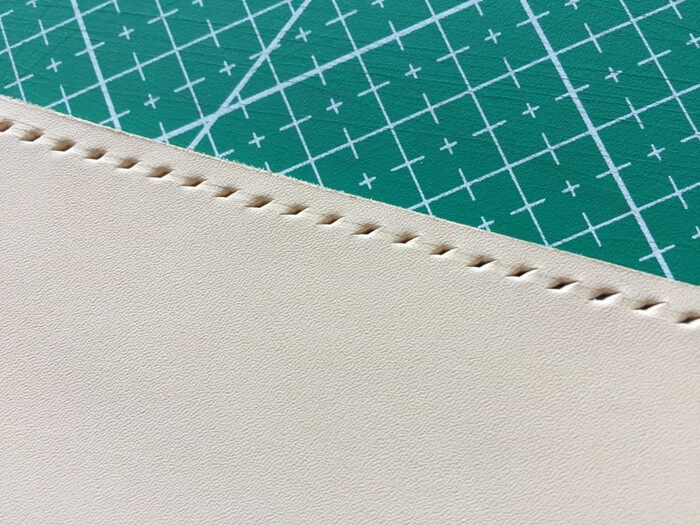 Lay the leather grain side up and mark the stitching line. 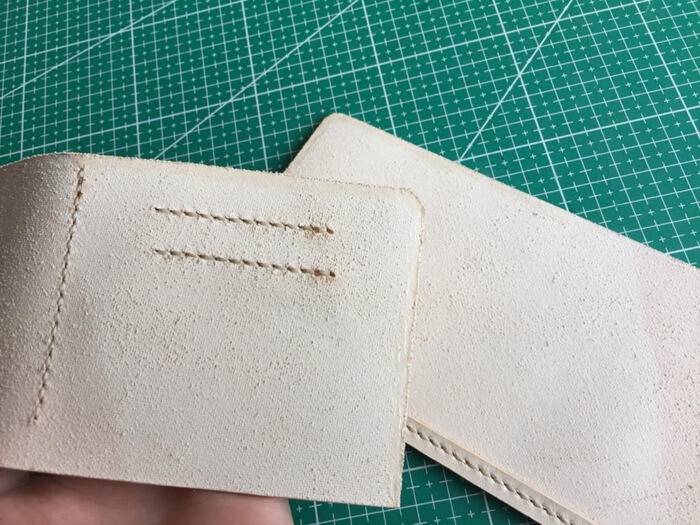 Punch holes and sew. 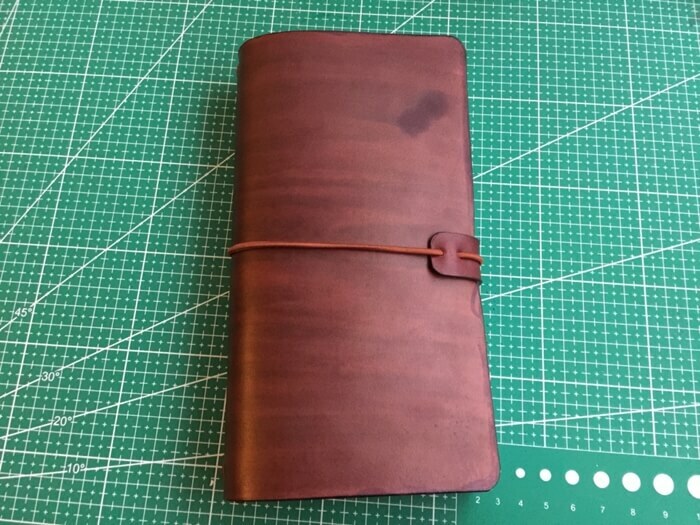 The cover is ready. 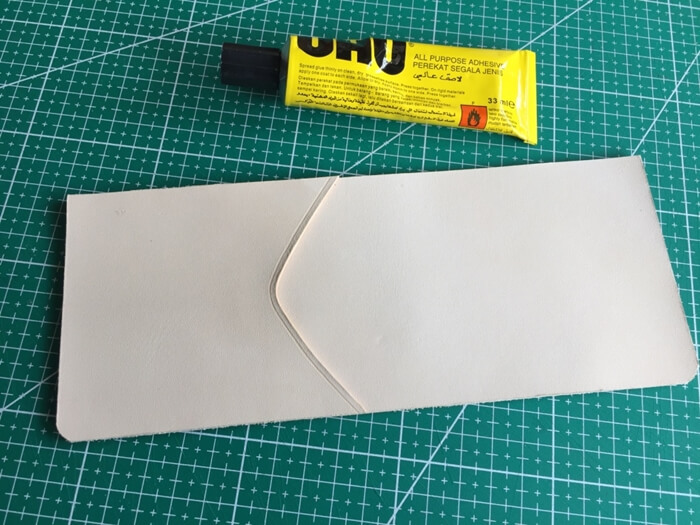 Glue the innder part to the main cover. 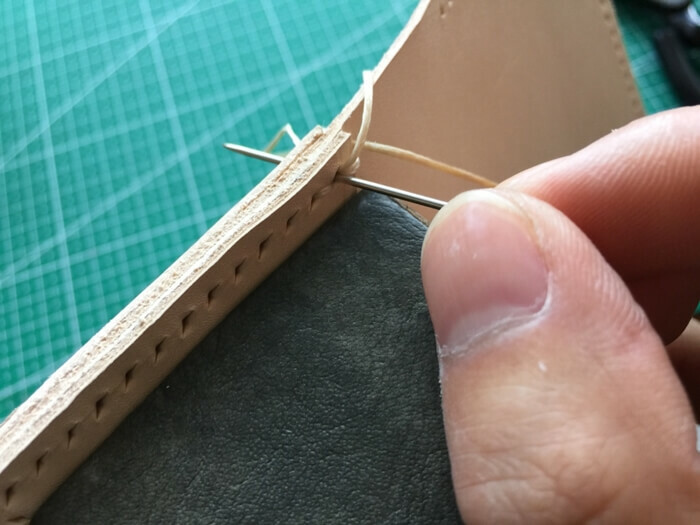 Mark stitching lines in the grain side of the main cover. 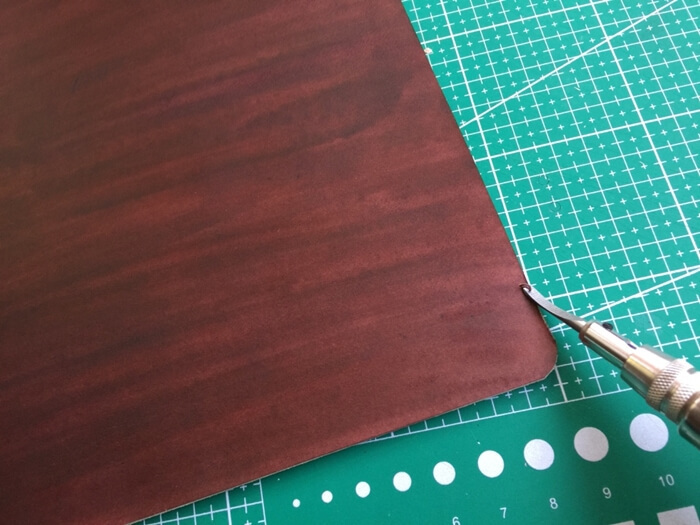 Polish the edges with polish stick and sandpaper. 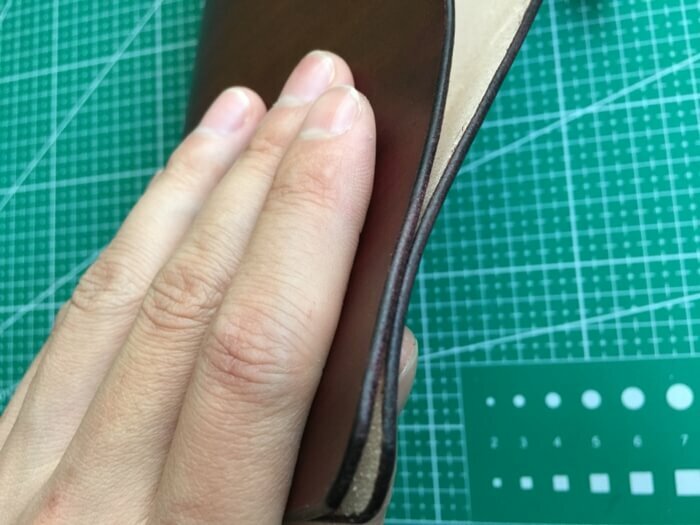 Apply leather finish gel and polish again. 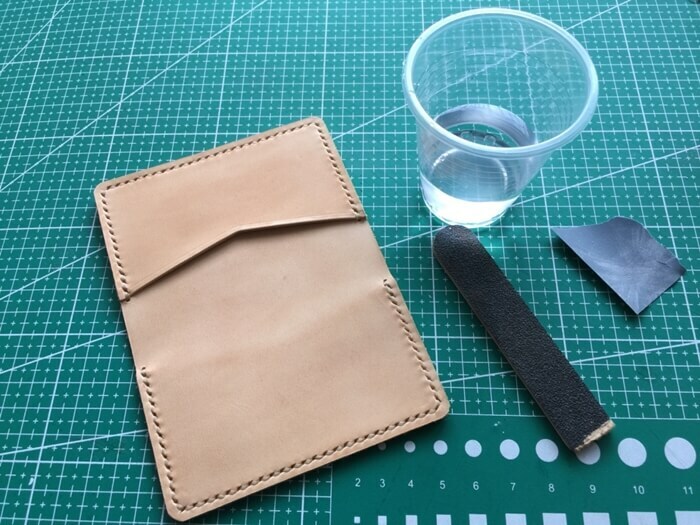 Again with edge wax and polish to bright with cotton cloth. 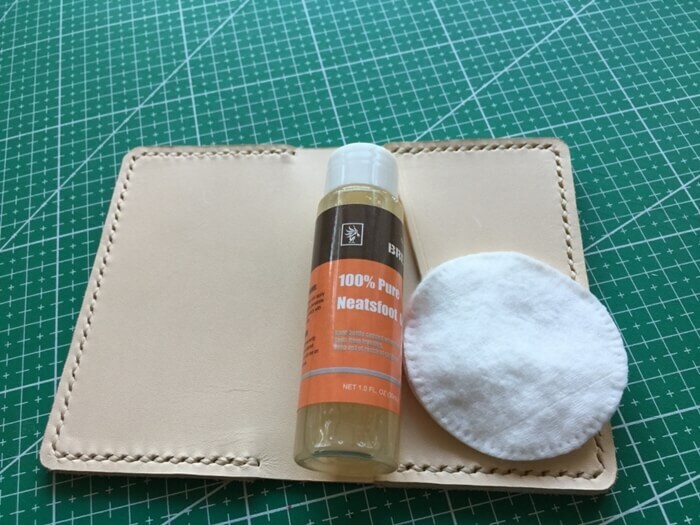 Rub on some neatsfoot oil onto the grain side and wait it dry. 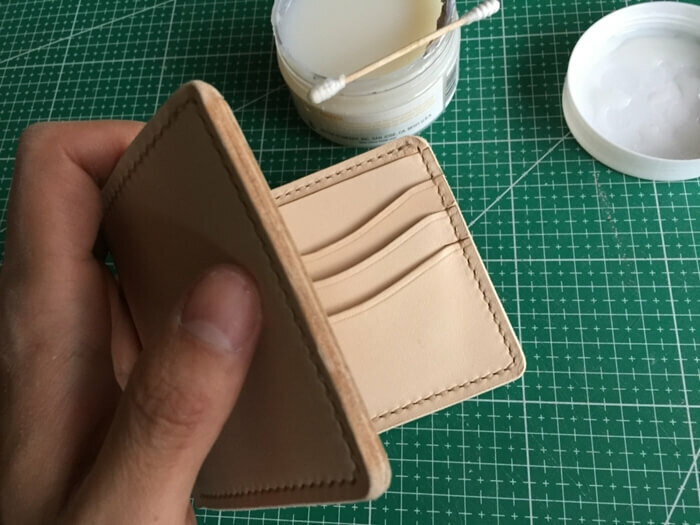 The top flap is very necessary, makes the wallet more charm and prevent cash from sliding out. 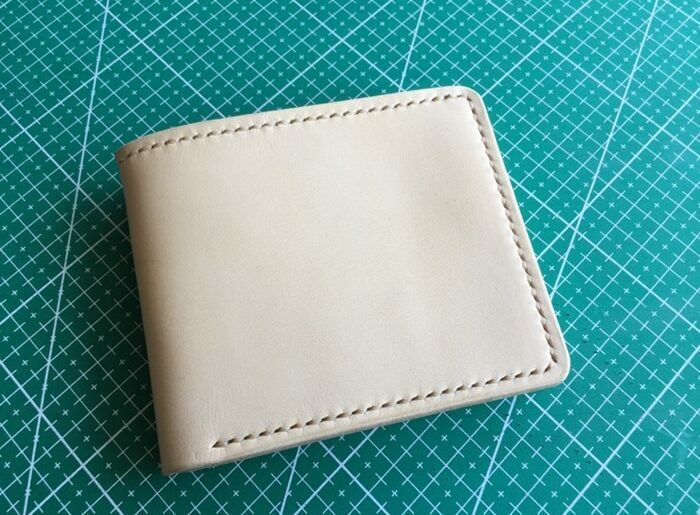 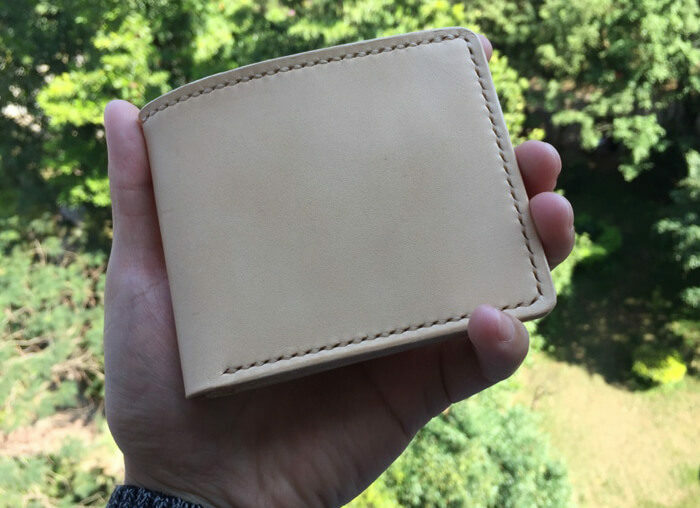 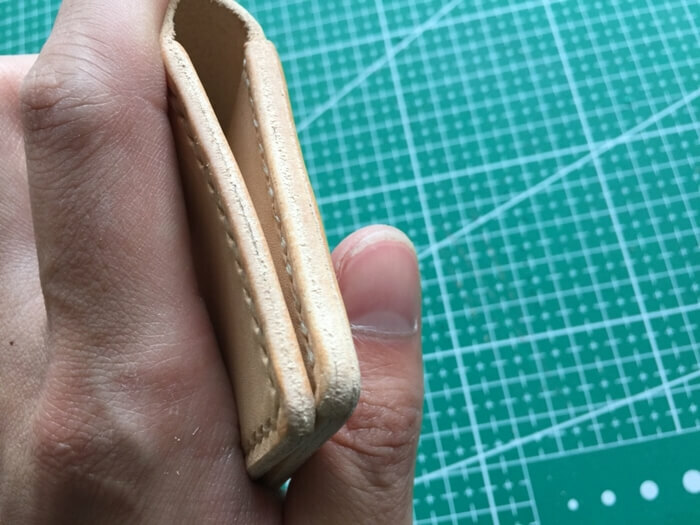 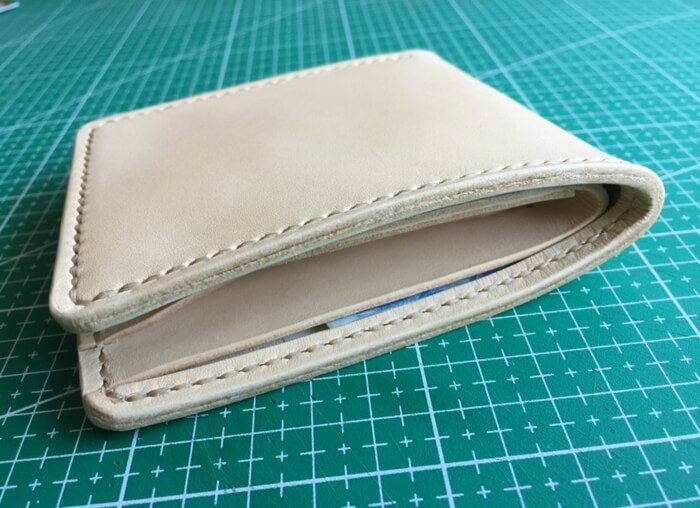 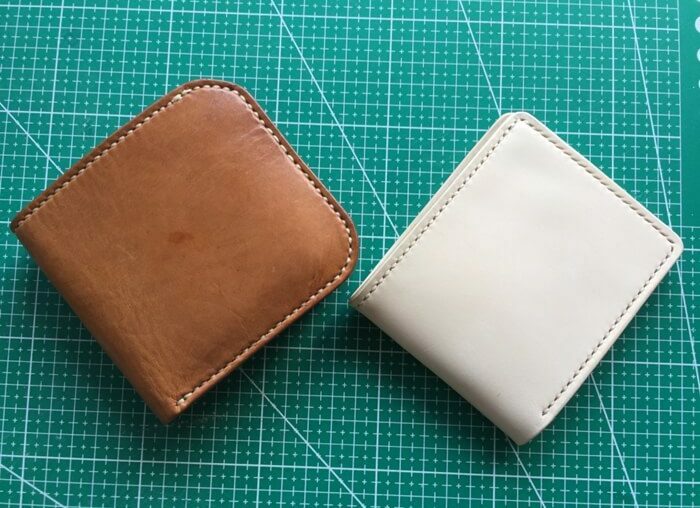 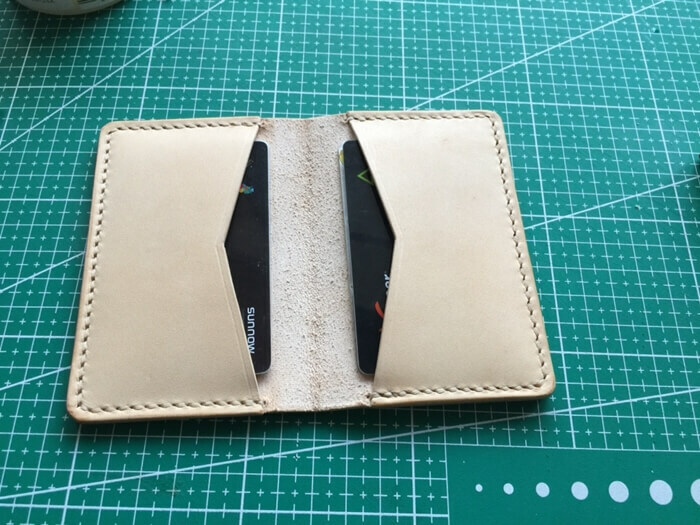 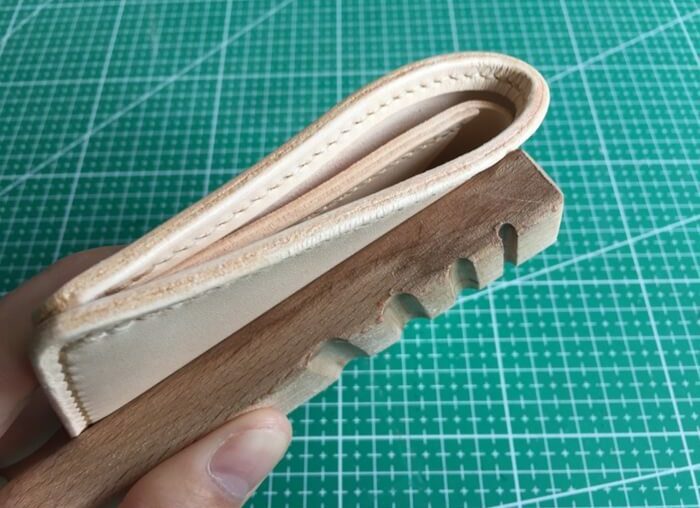 Ok now, a brand new handmade leather wallet! 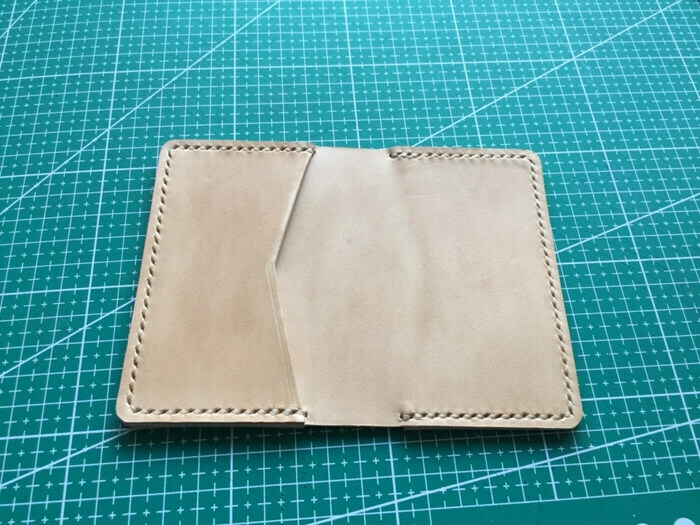 Like this style and want to make yours? 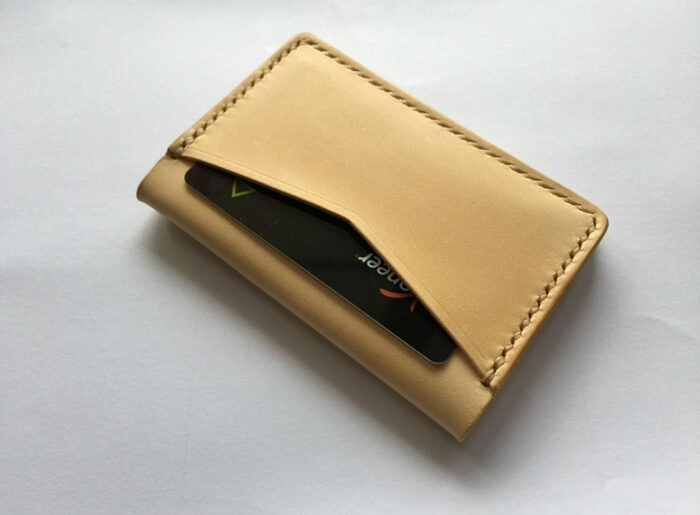 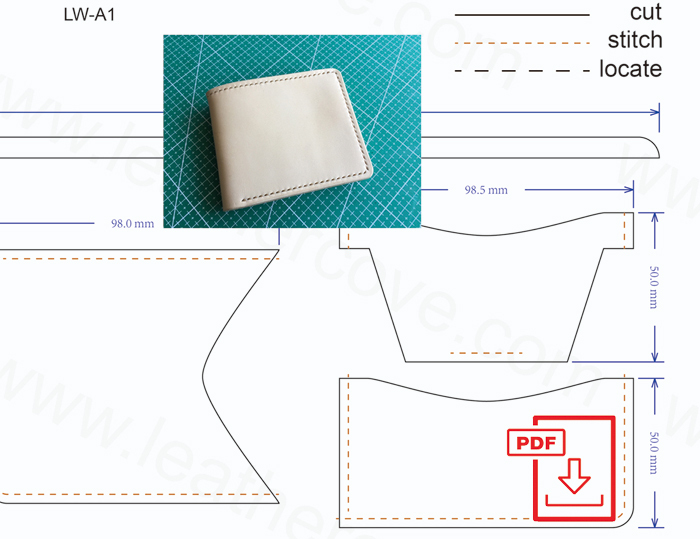 You may want to download the PDF Pattern for this wallet. 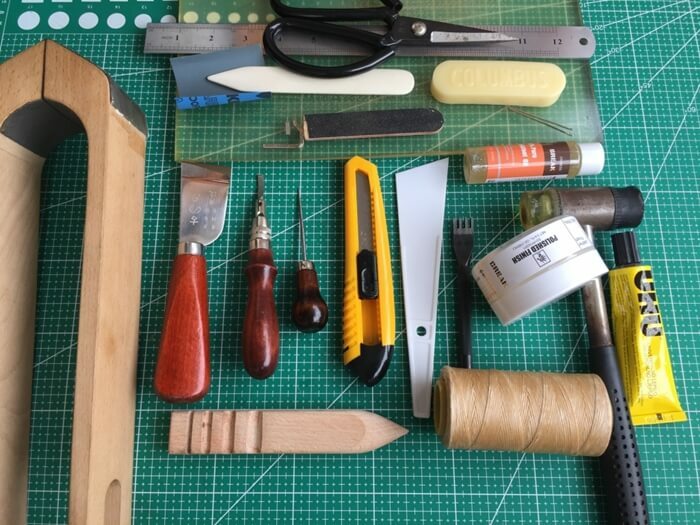 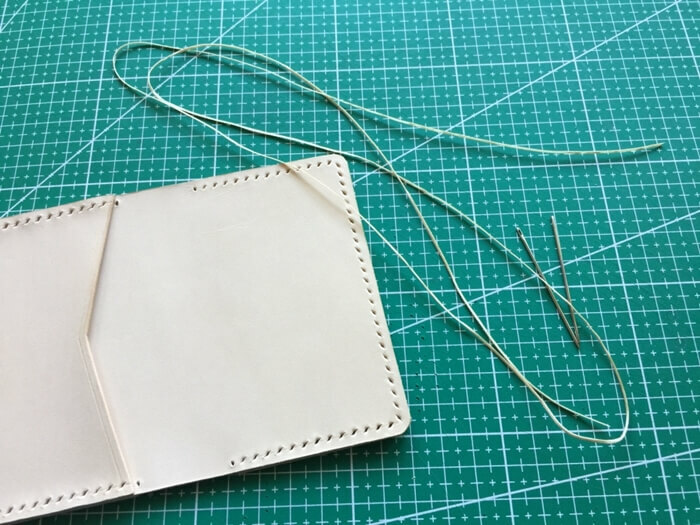 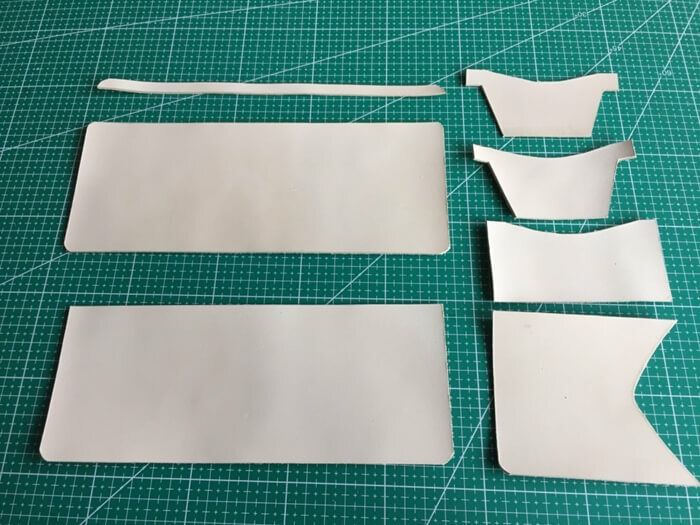 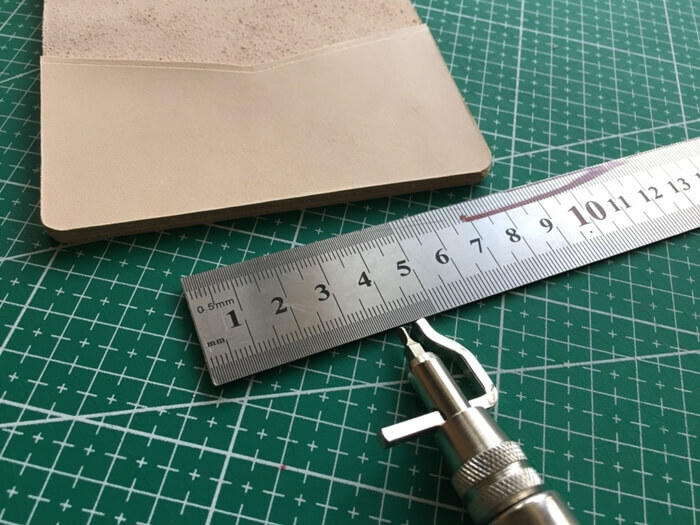 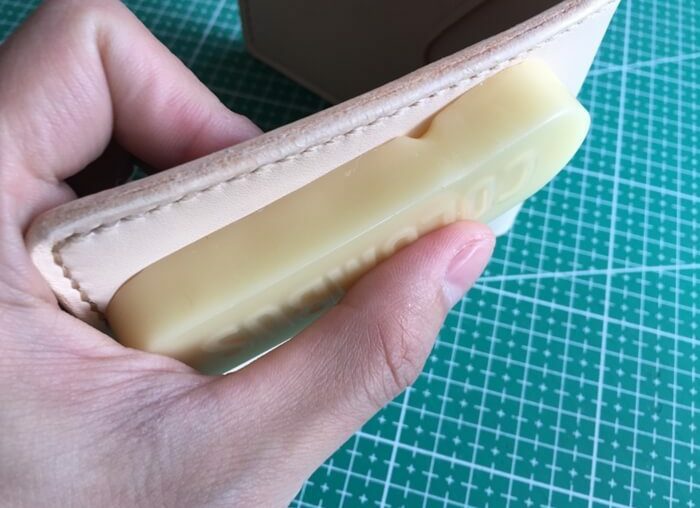 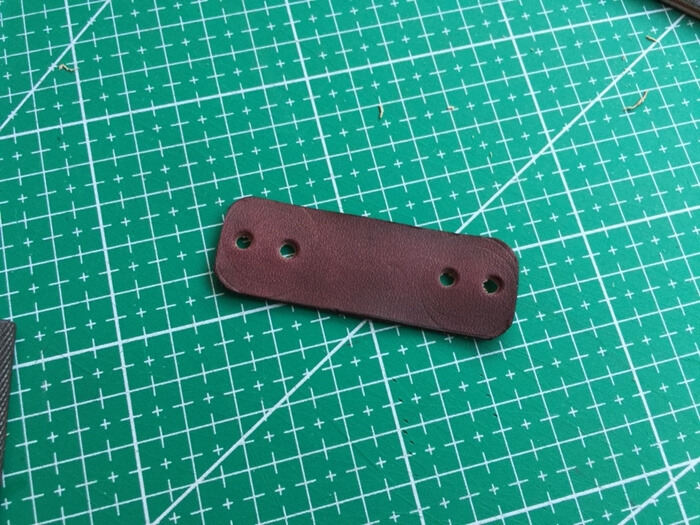 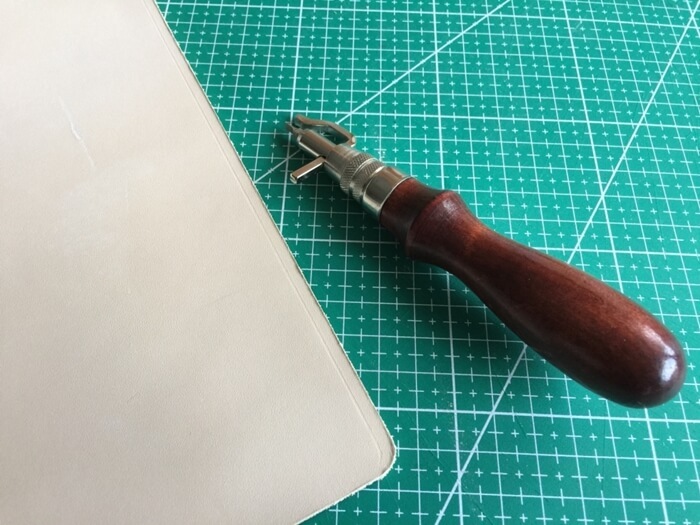 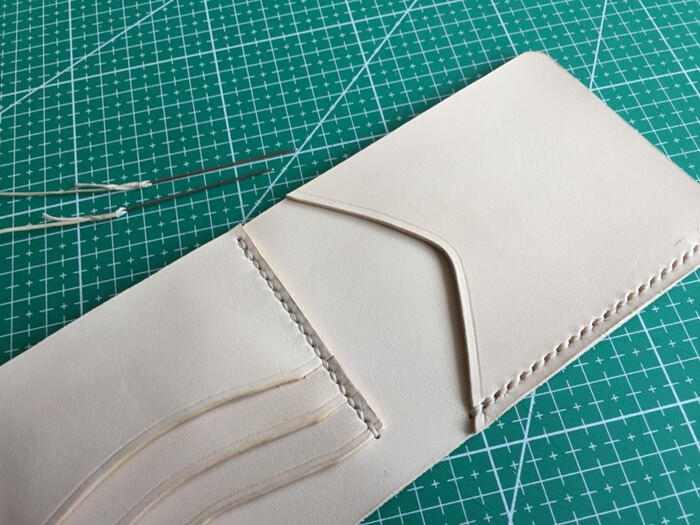 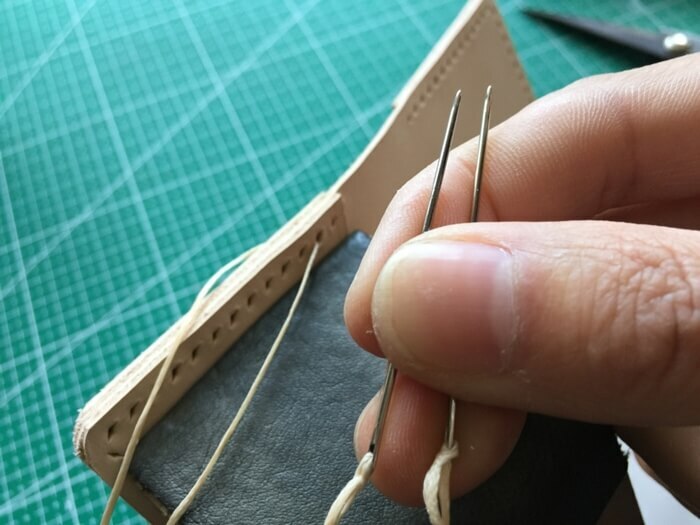 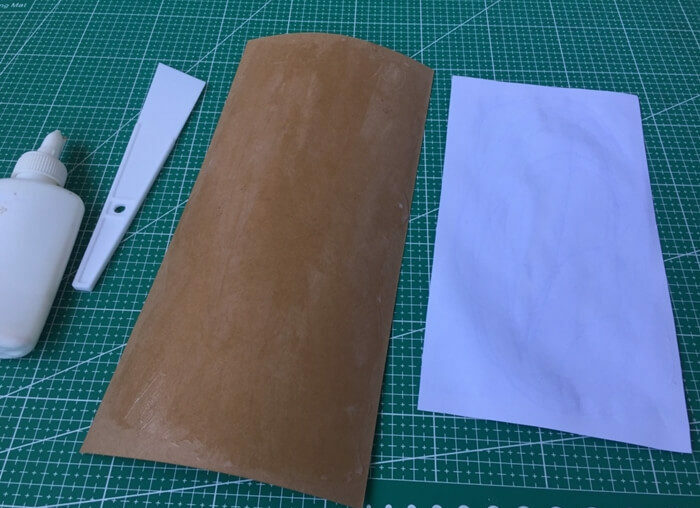 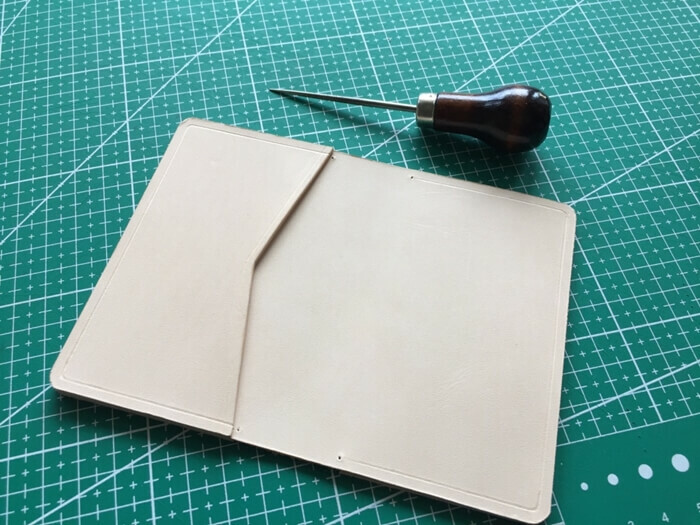 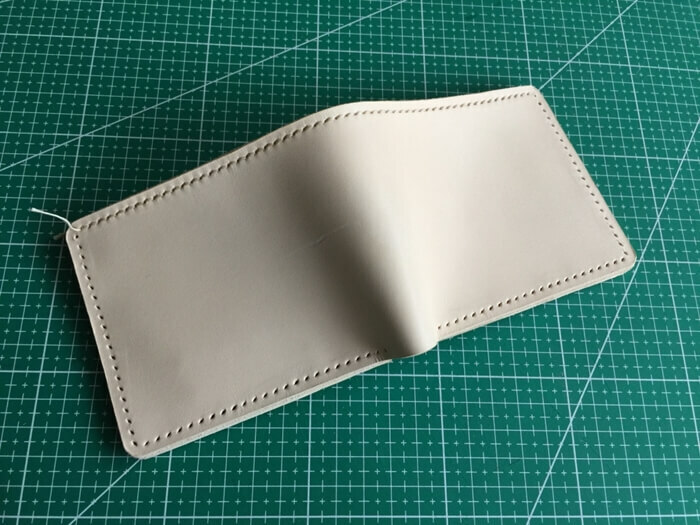 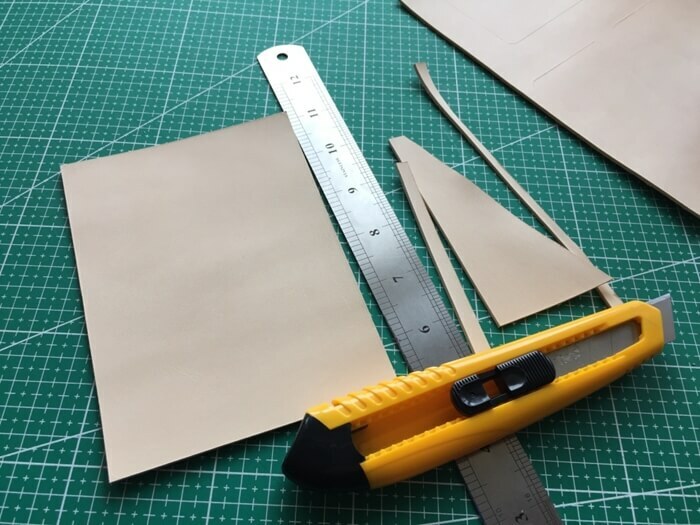 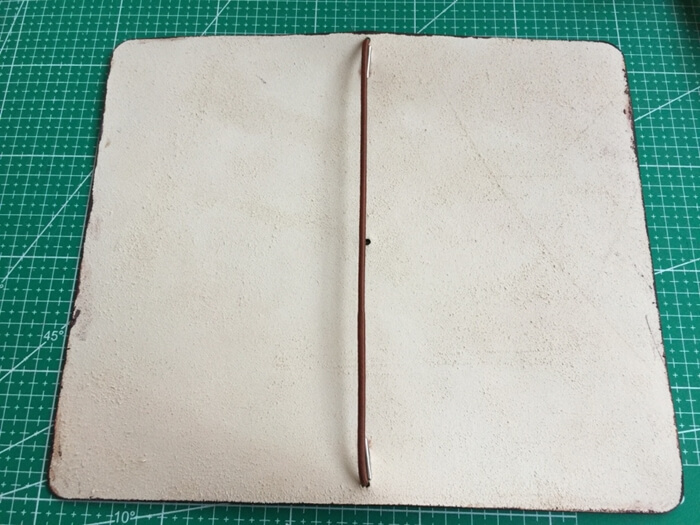 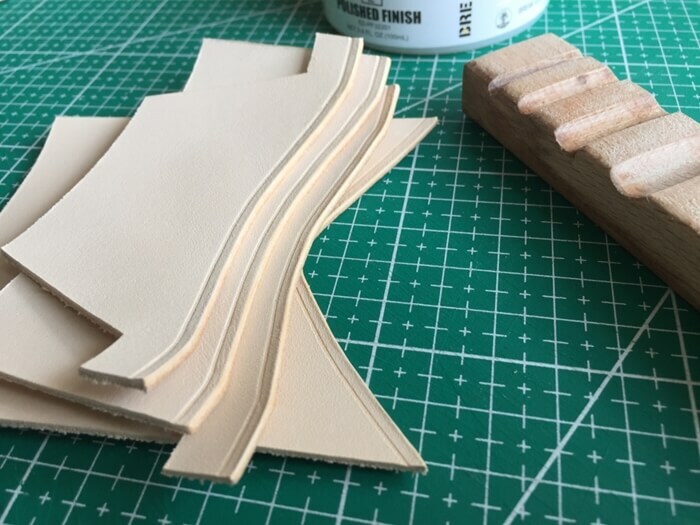 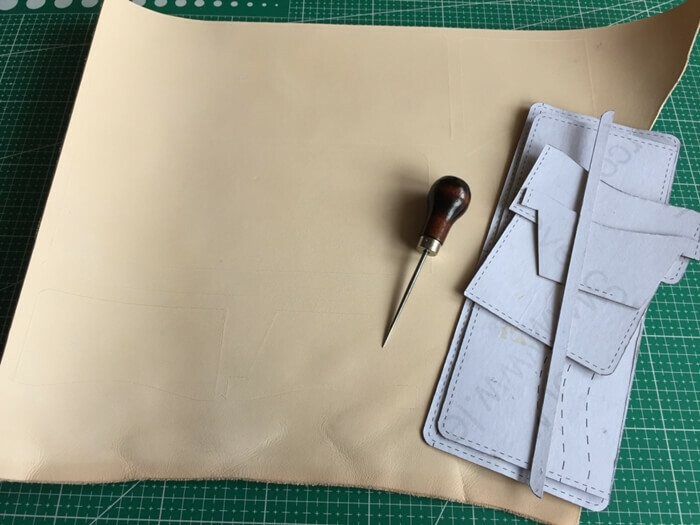 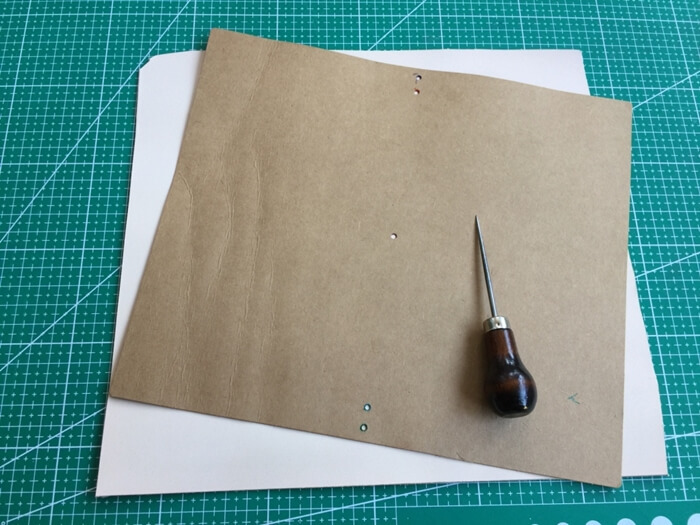 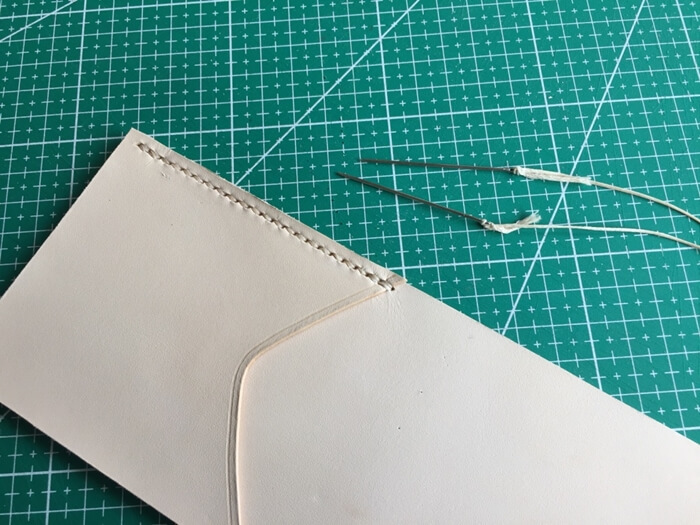 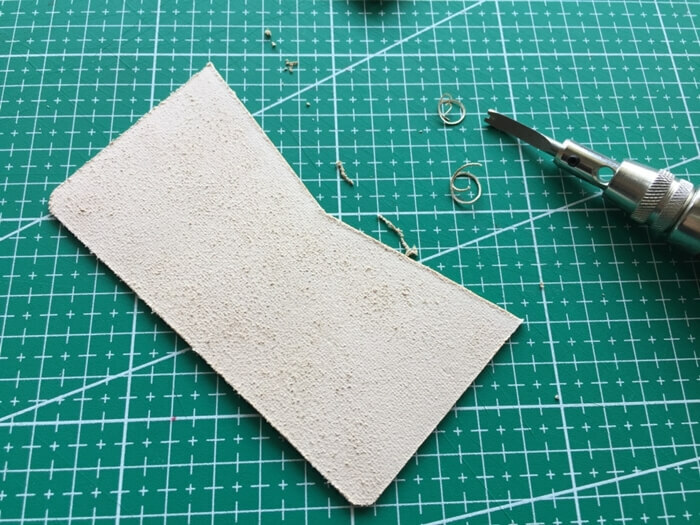 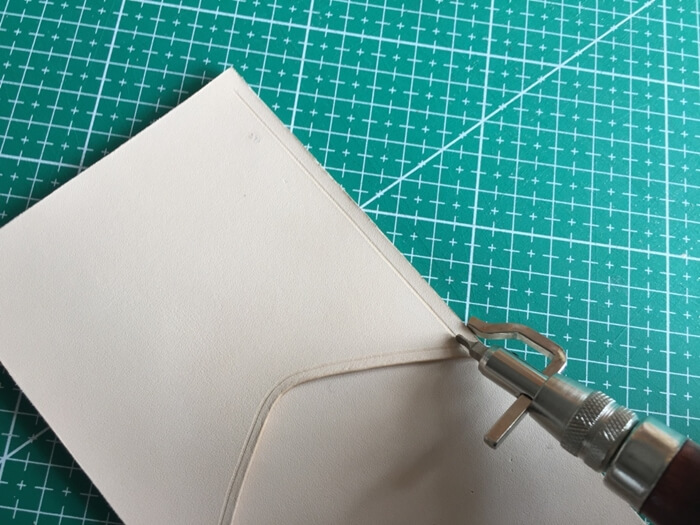 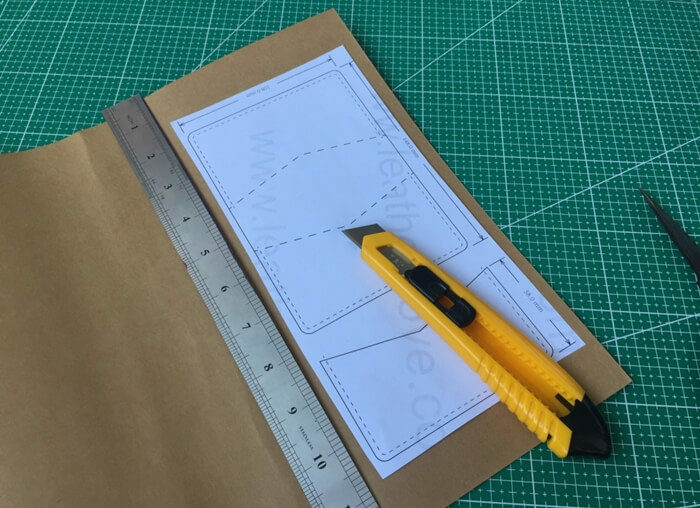 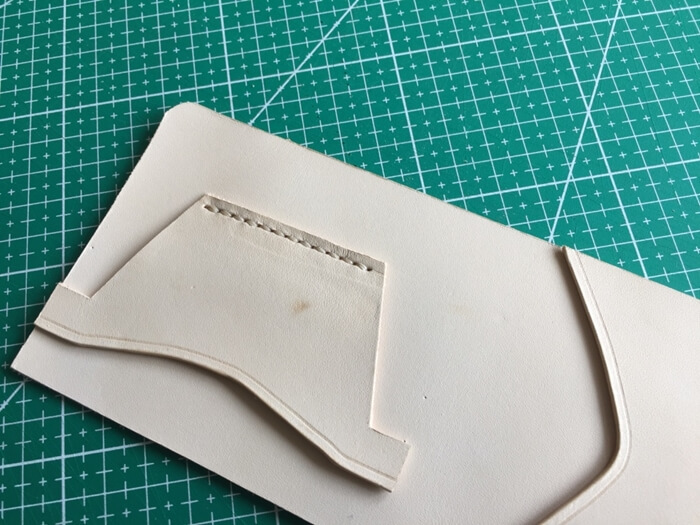 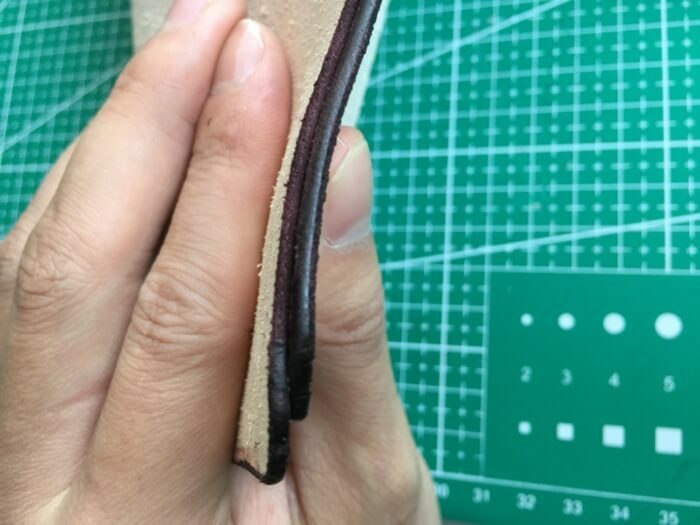 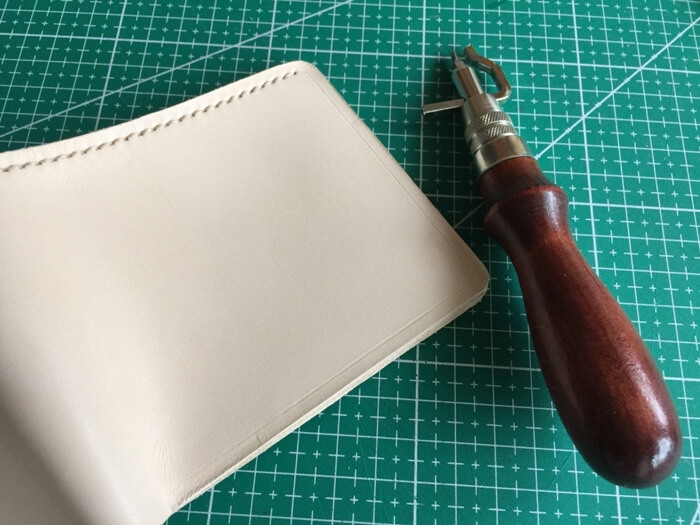 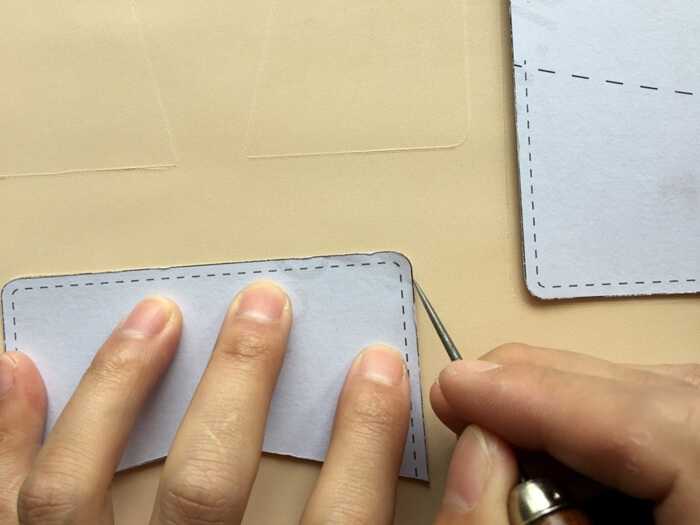 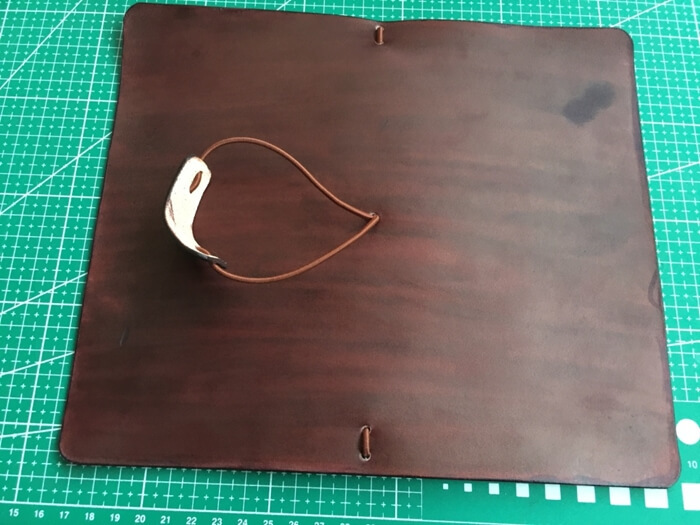 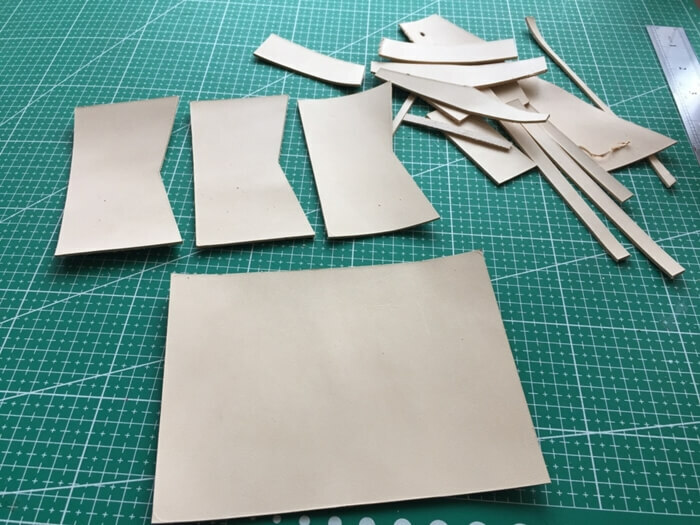 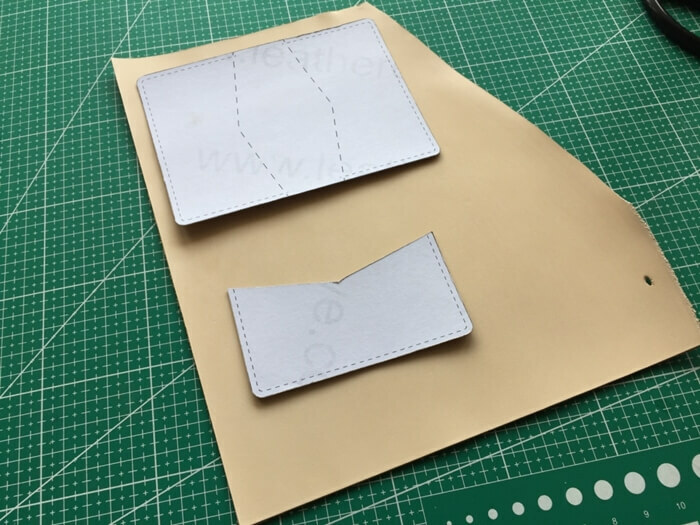 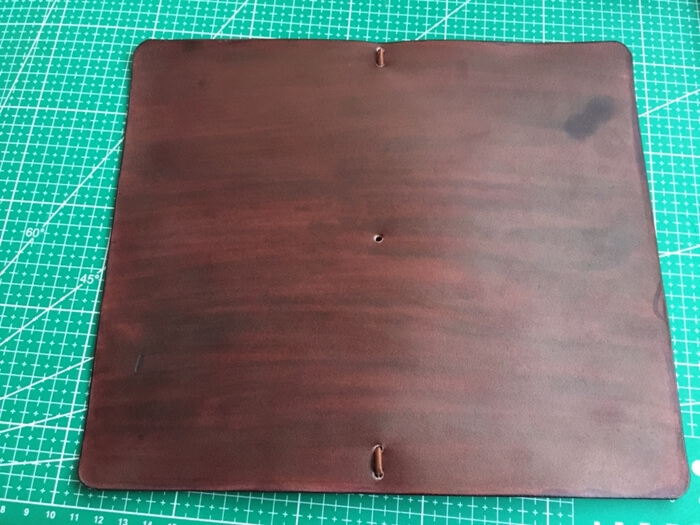 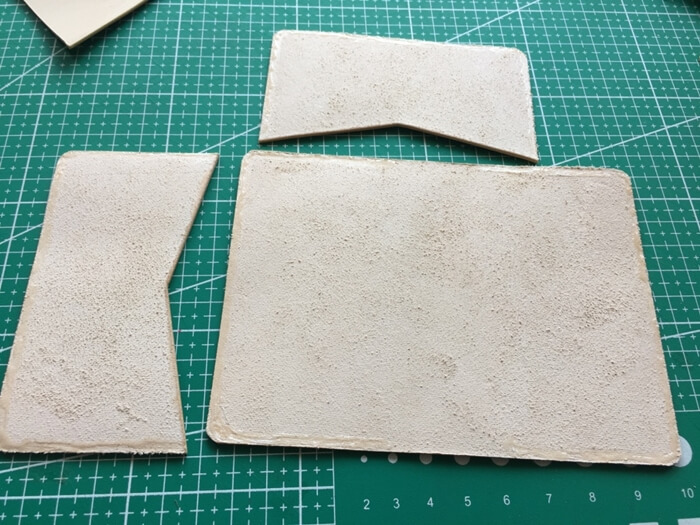 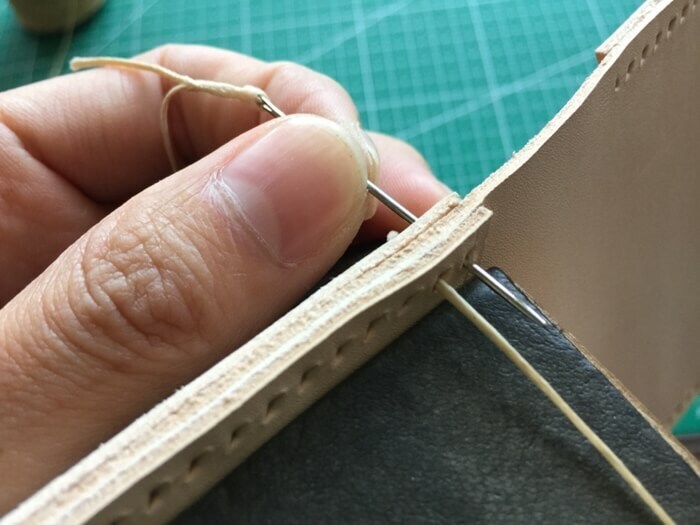 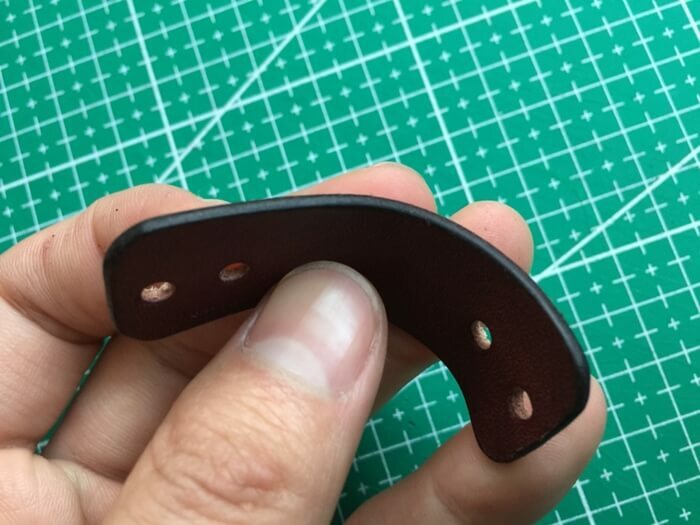 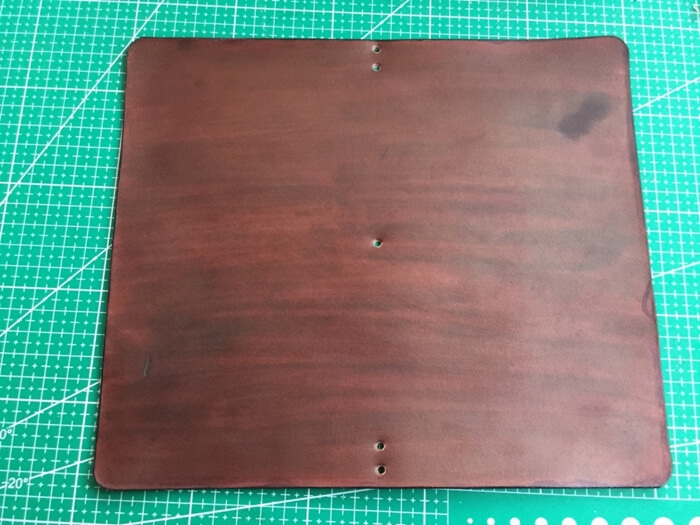 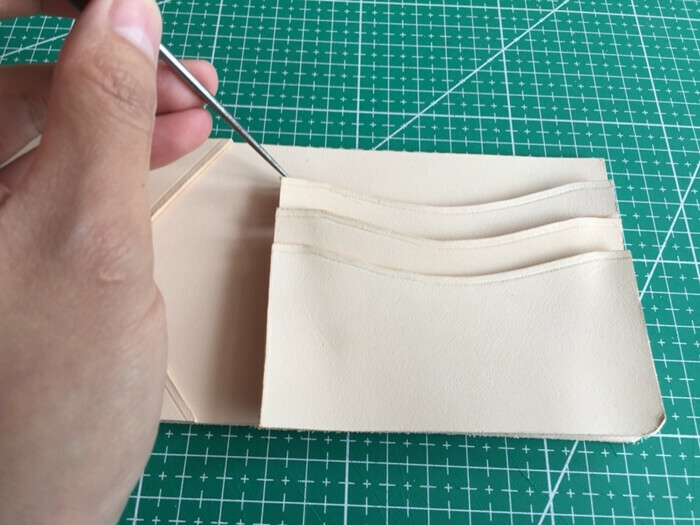 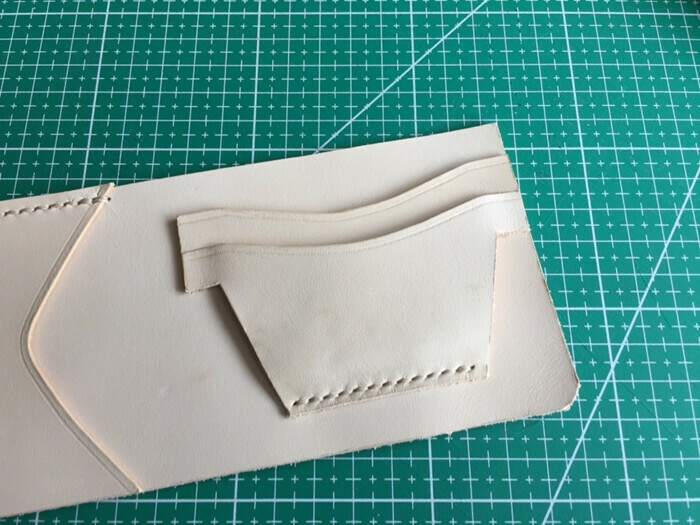 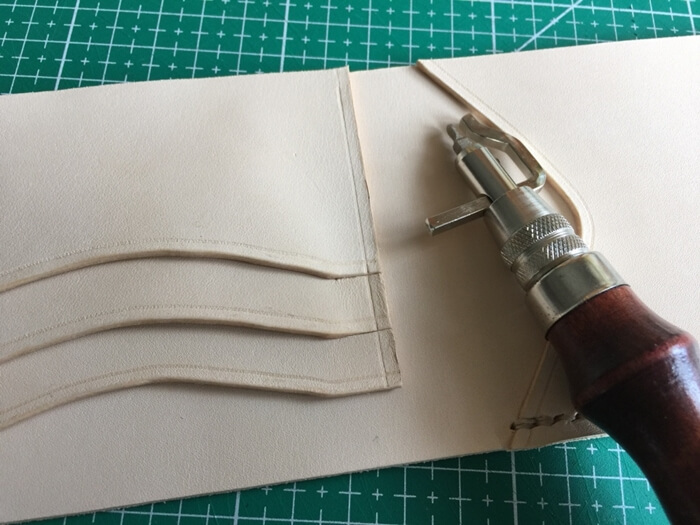 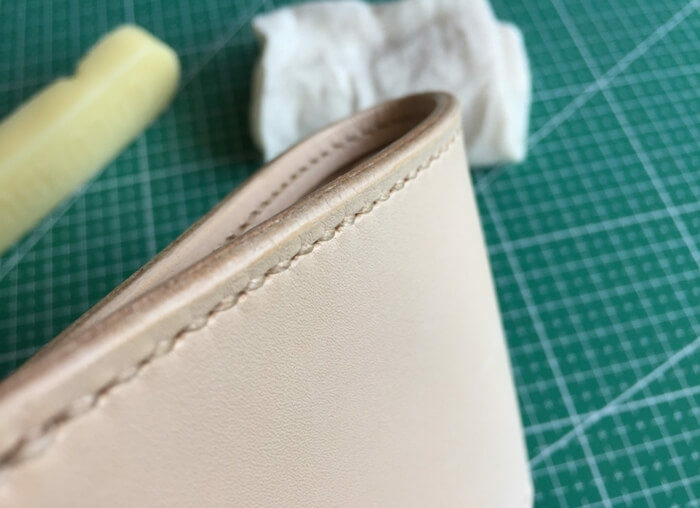 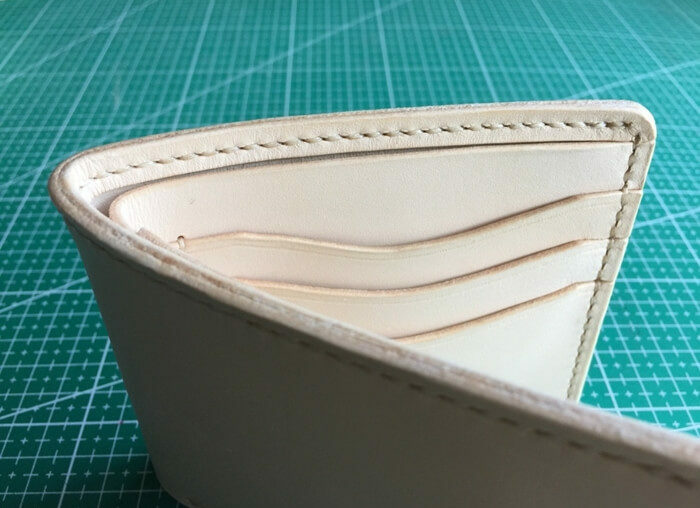 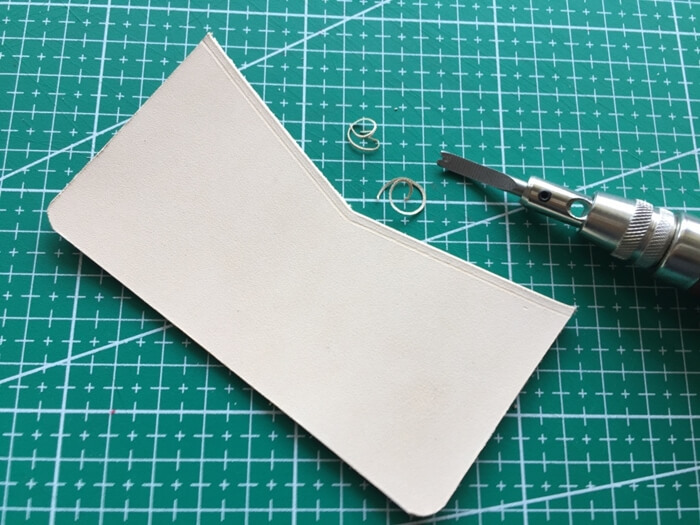 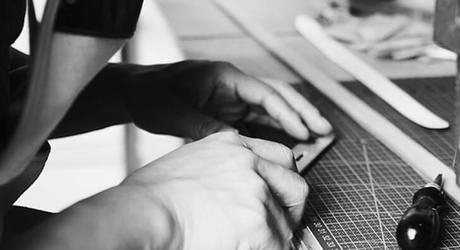 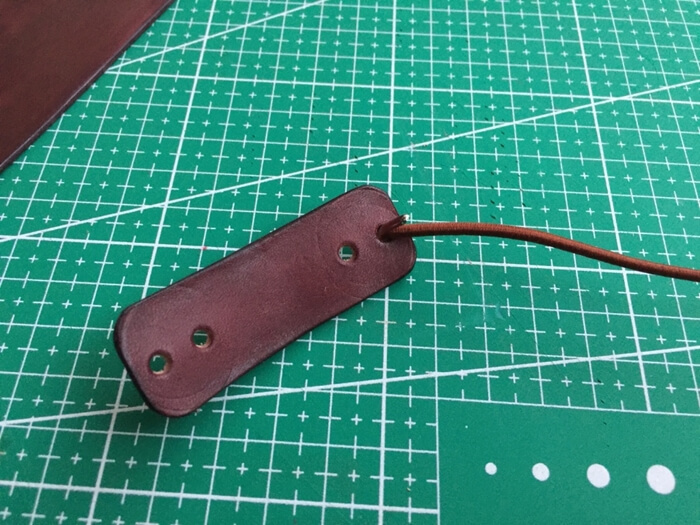 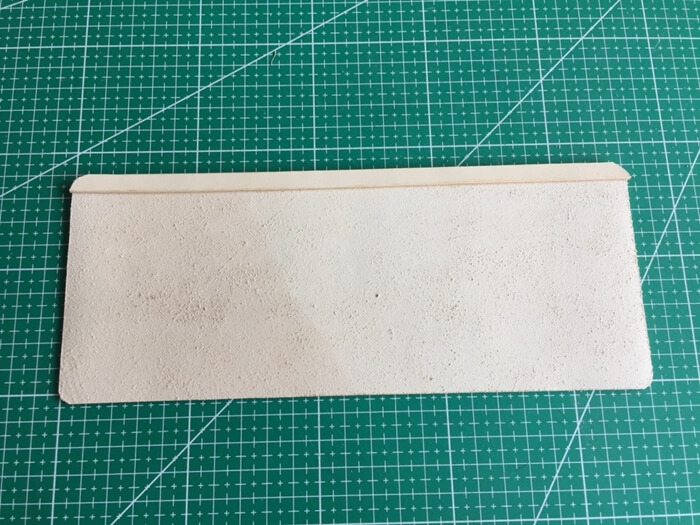 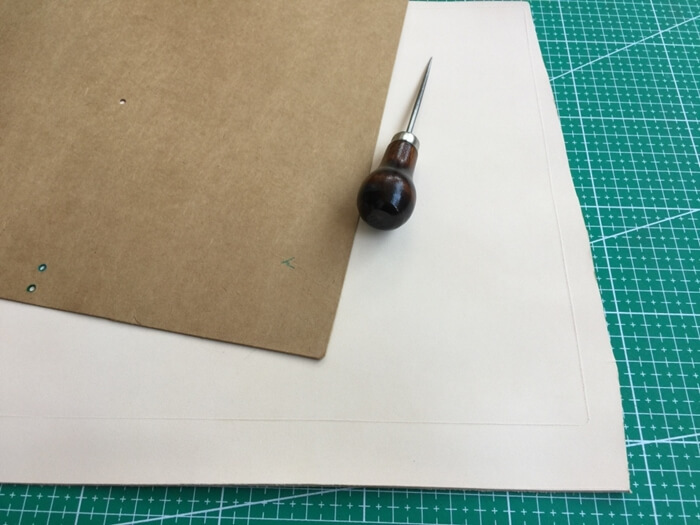 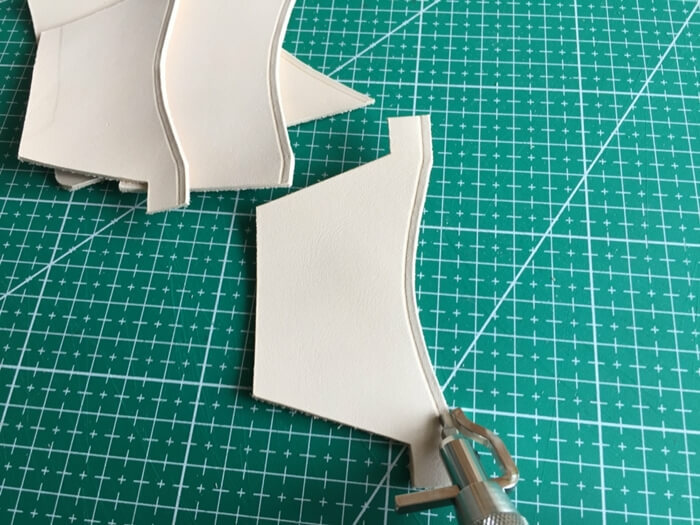 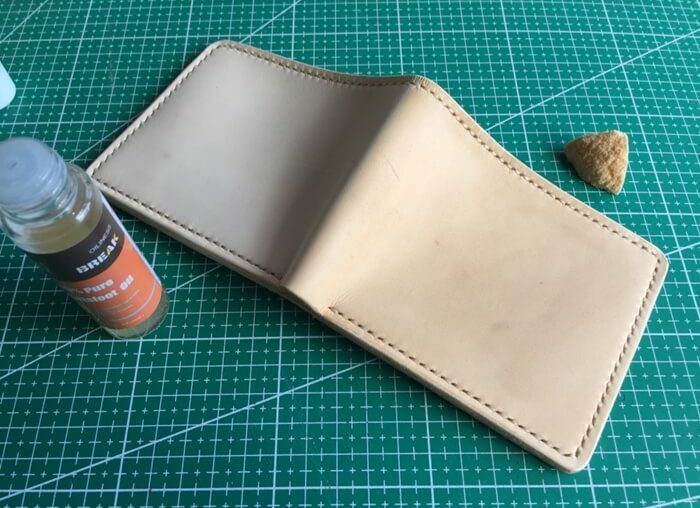 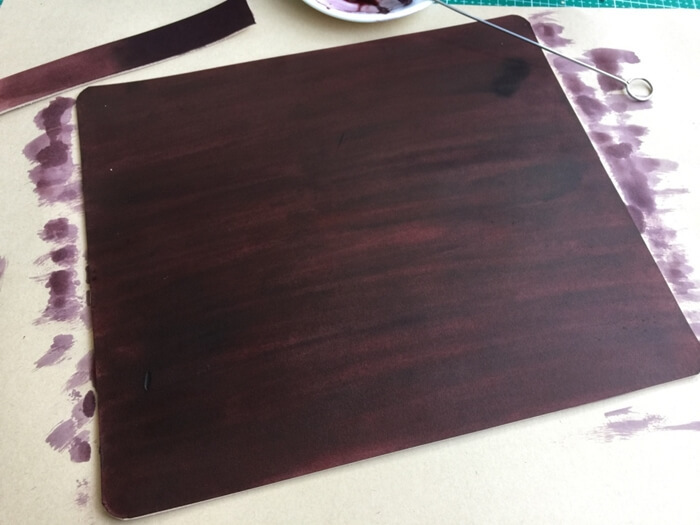 When you get a leather pattern or want to make a leather article, the first thing you need to do is make a leather template, a good leather template is the basic of a fine handmade leather piece. 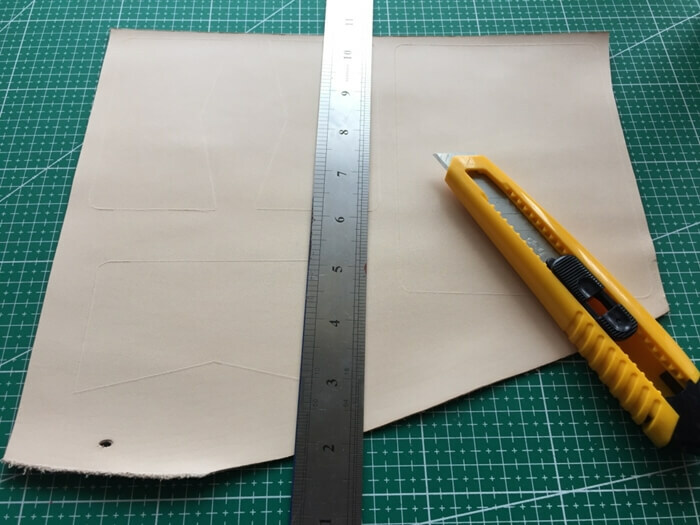 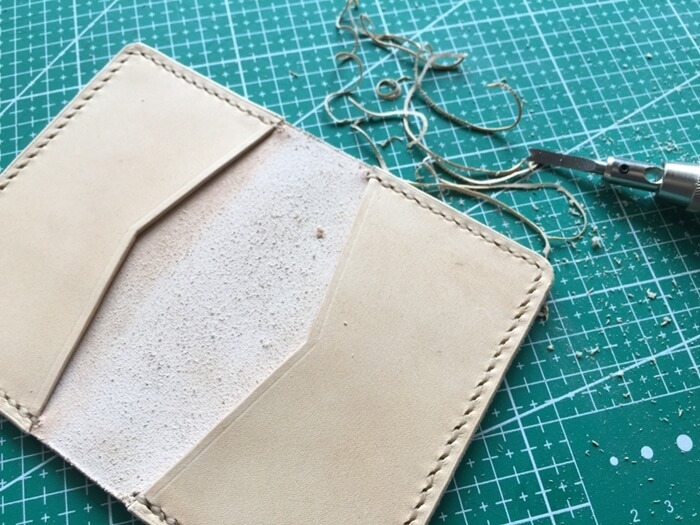 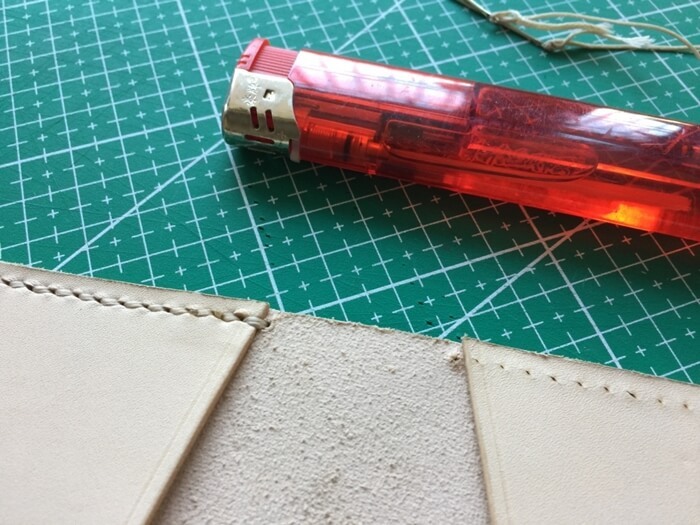 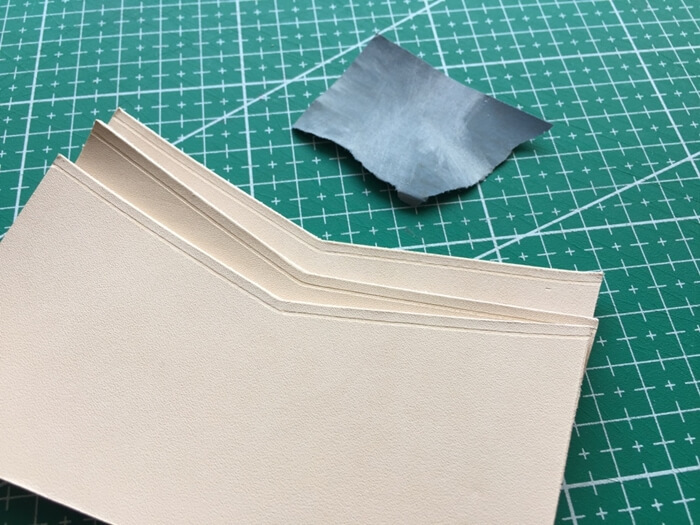 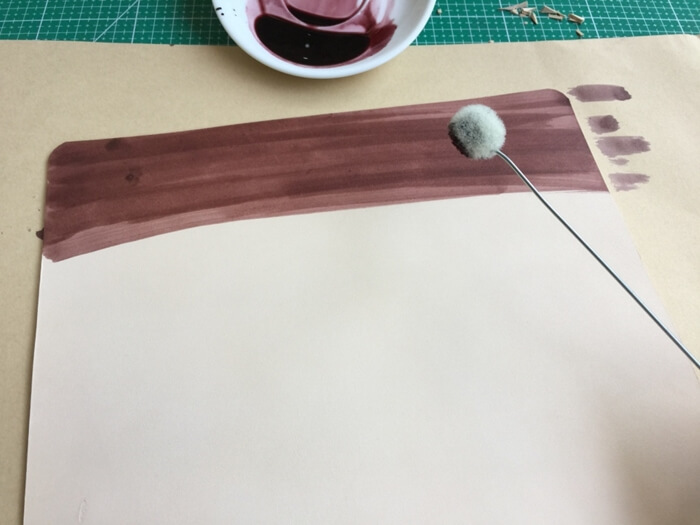 In below steps, I am going to show you how to make a leather template in the simplest way. 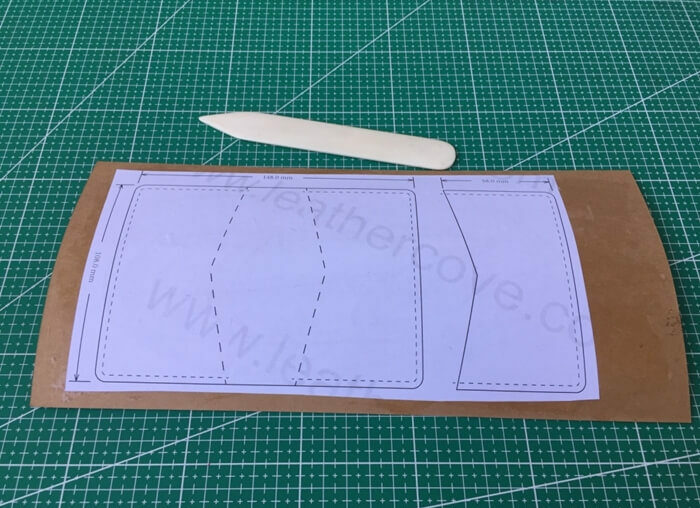 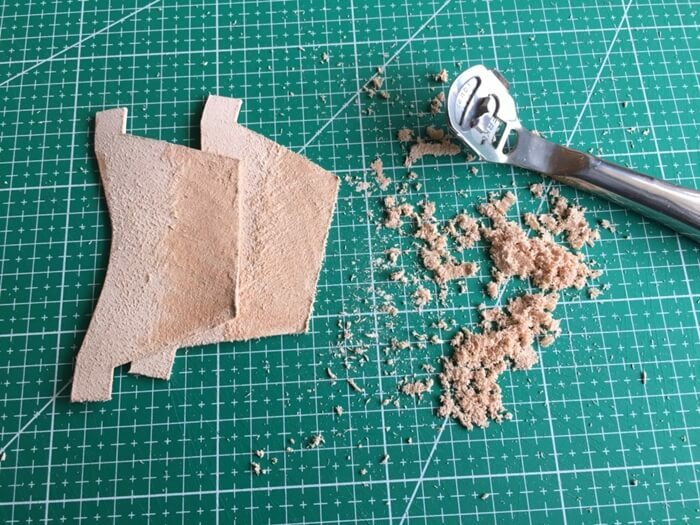 Print out the leather pattern and rough cut to keep the main leather pattern part. 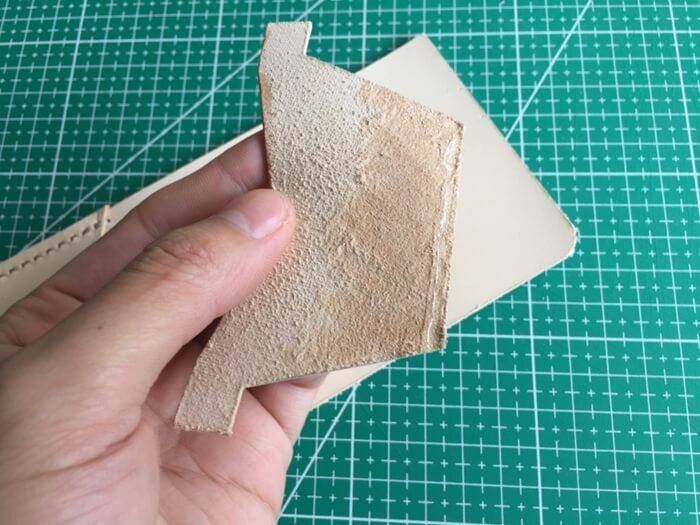 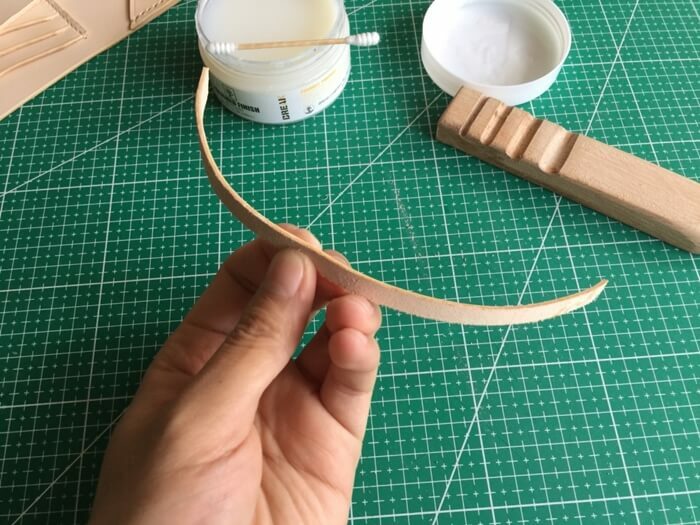 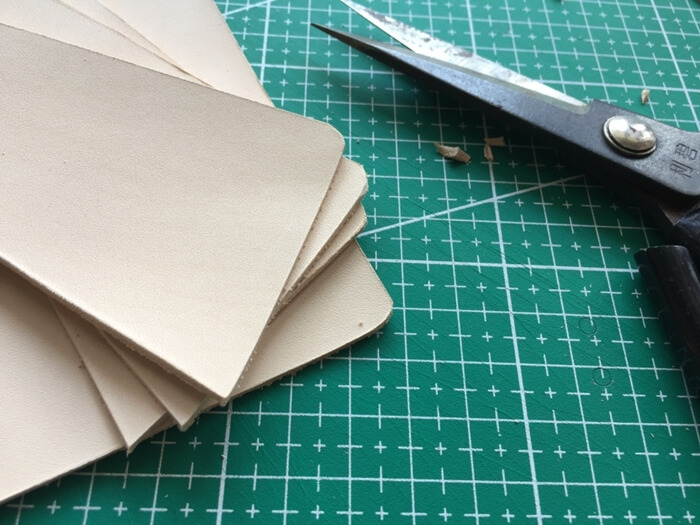 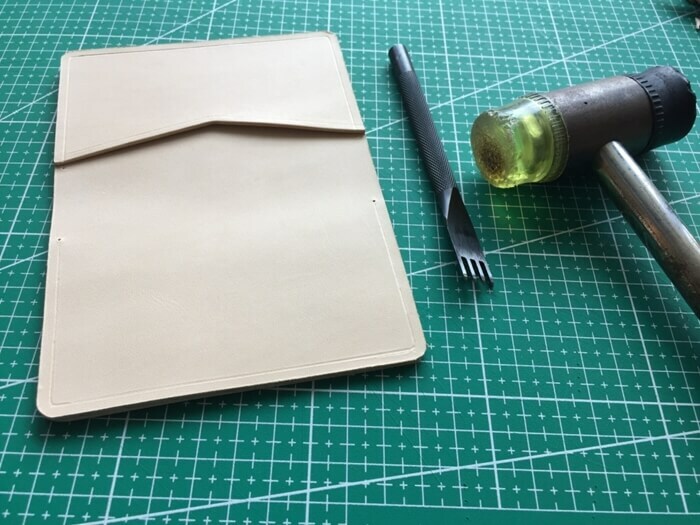 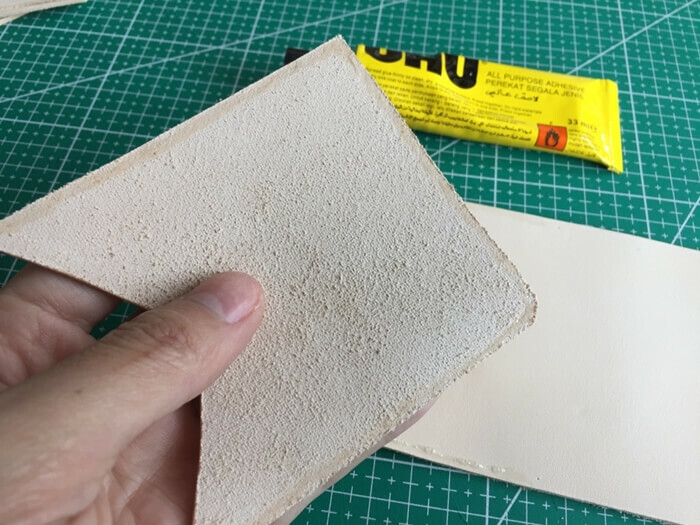 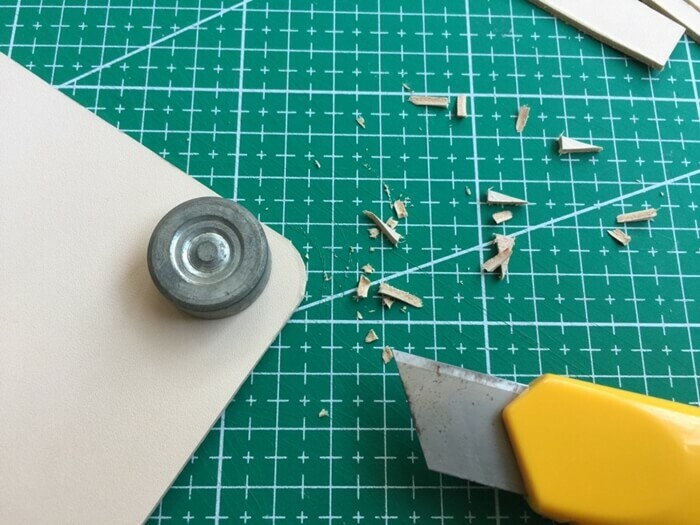 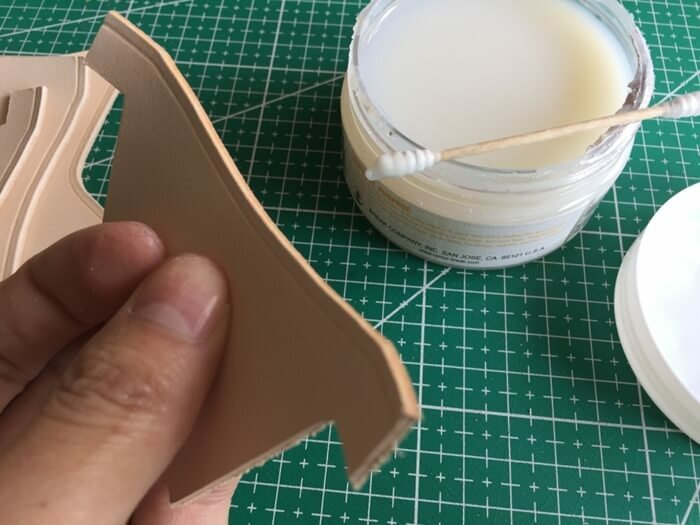 Here we use 450g thick kraft paper, cut a piece that little bigger than the pattern, put glue evenly on the back with a glue stick and then glue them together. 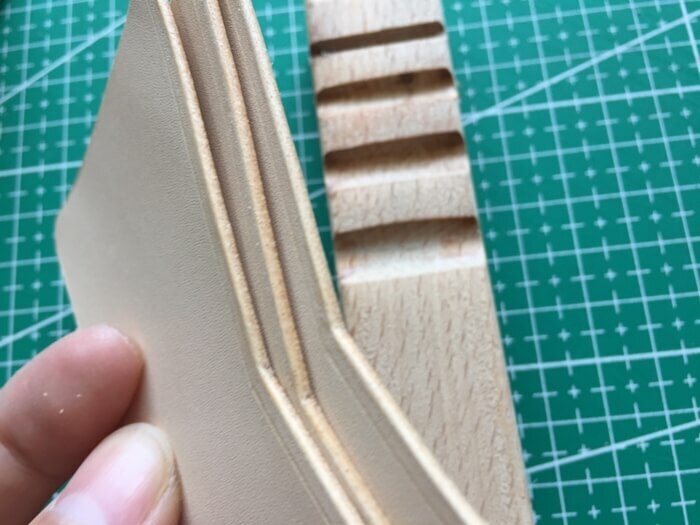 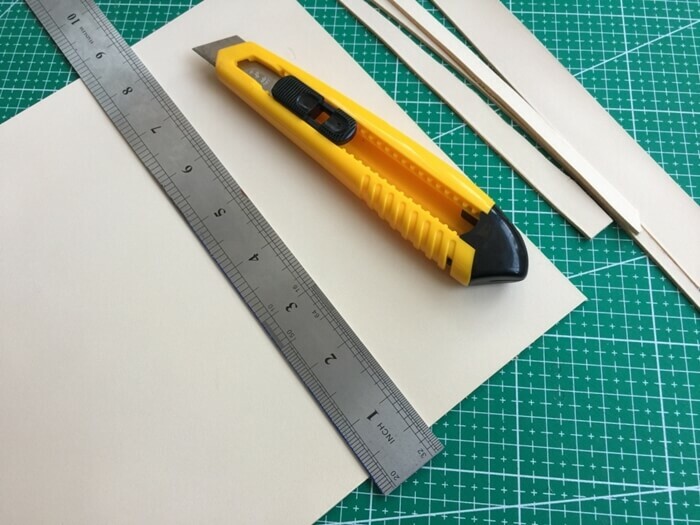 Start to cut when the glue dry, for the straight sides, we can cut directly by using cutter and ruler; for the angle joints, we can make a small hole with a awl or needle and then cut out. 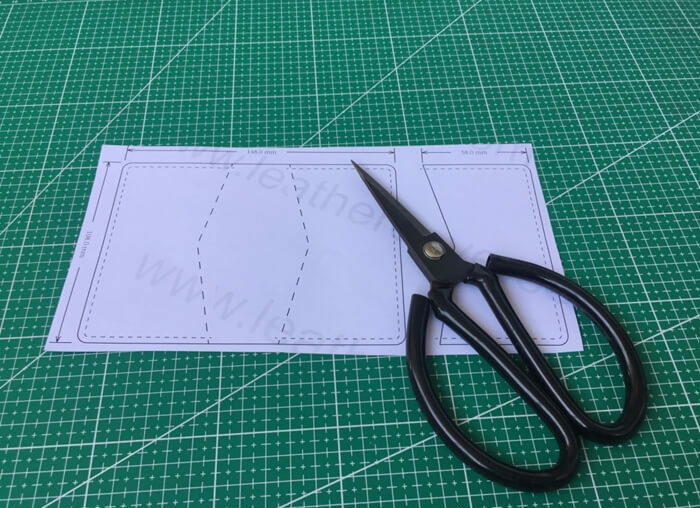 For the patterns which have round corners, then scissor is the simplest and best tool. 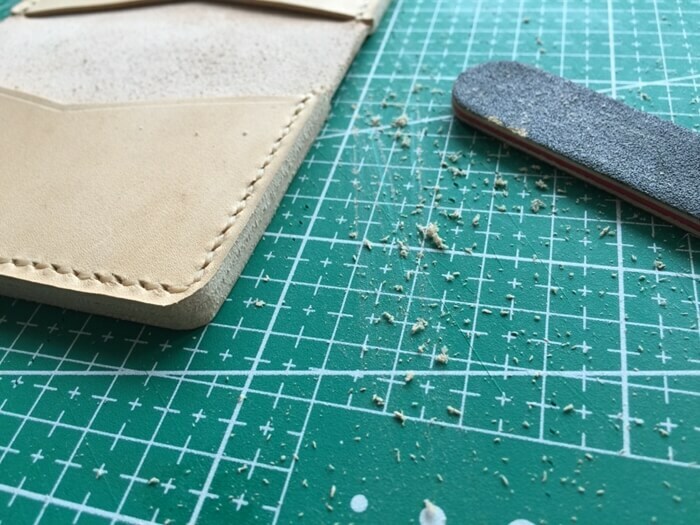 If necessary, use sandpaper to polish the corners. 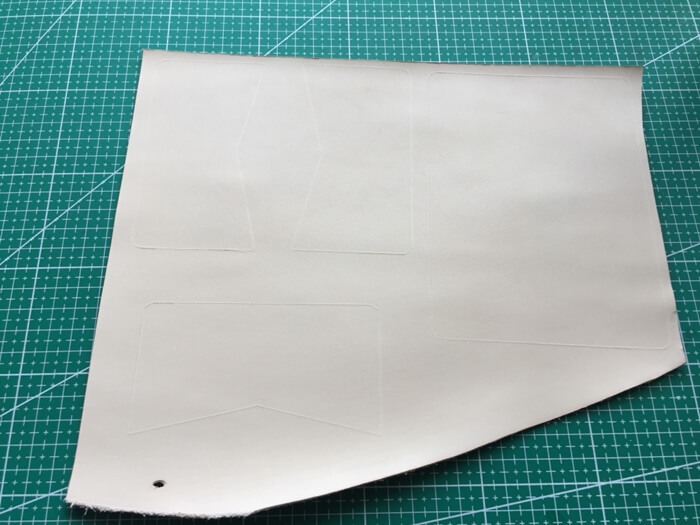 Ok now, a leather pattern is ready to use. 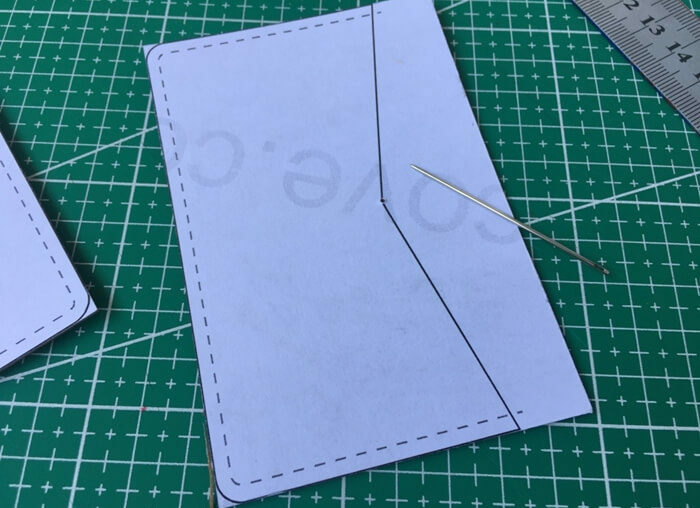 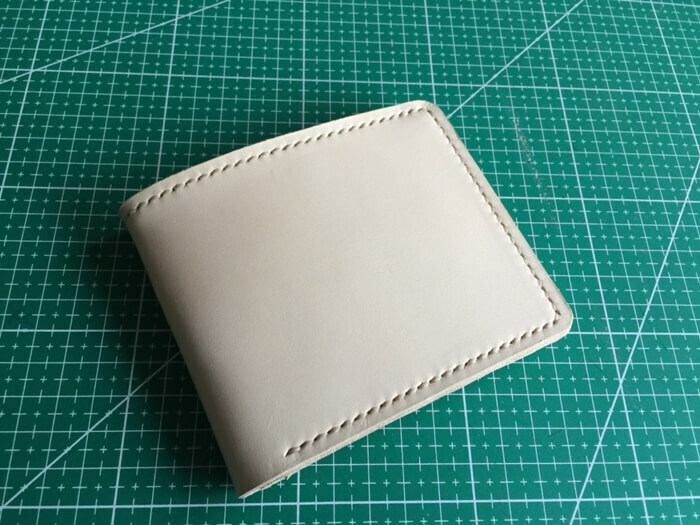 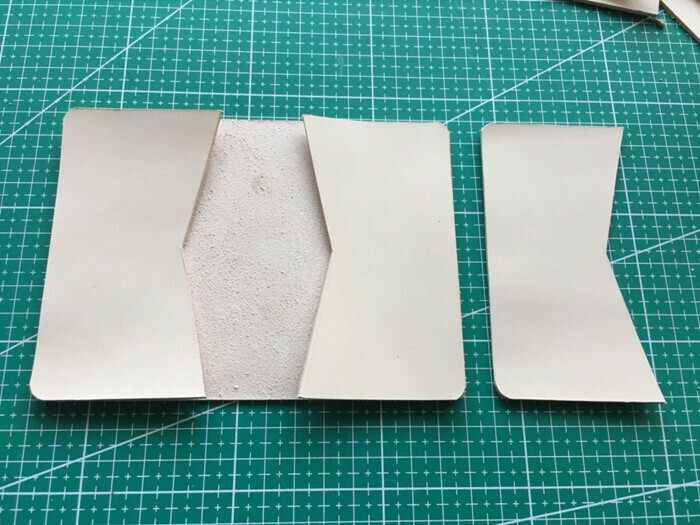 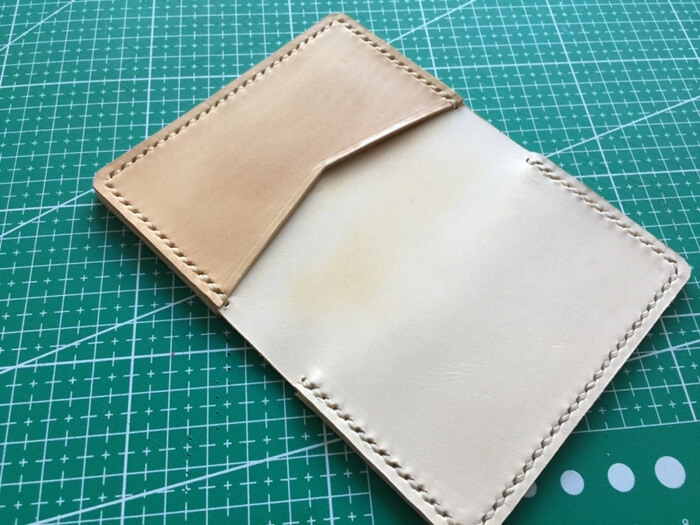 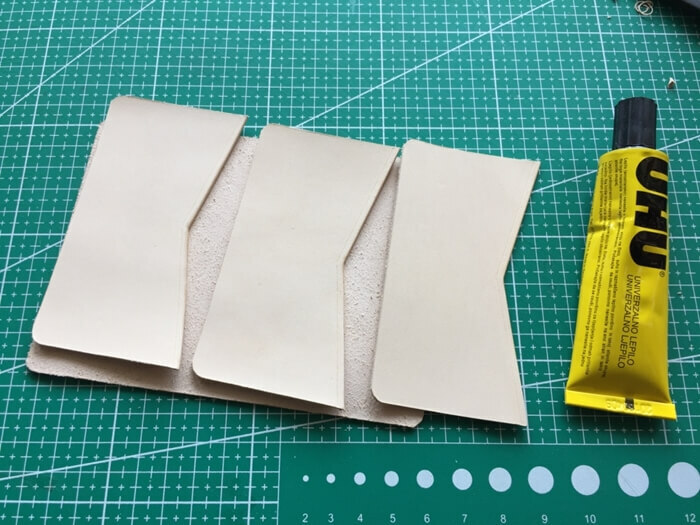 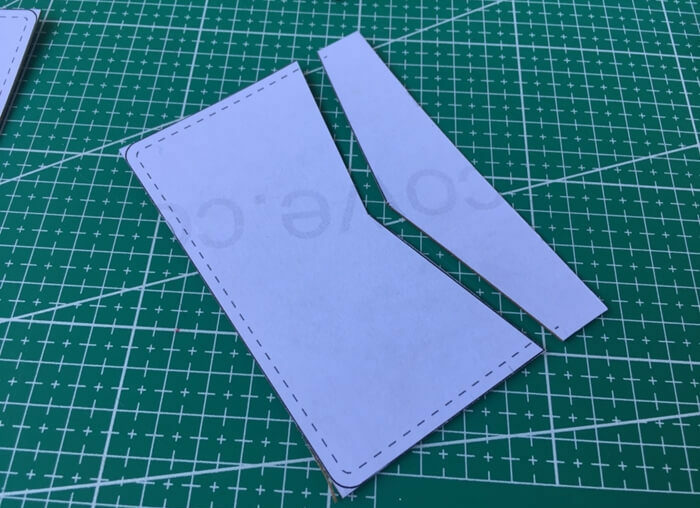 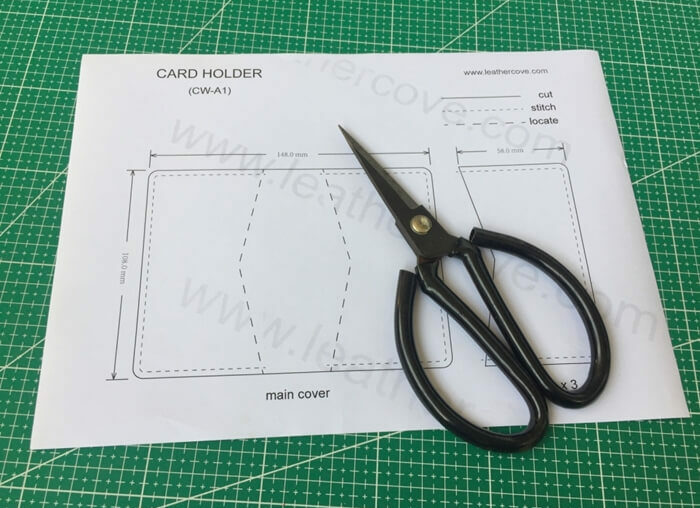 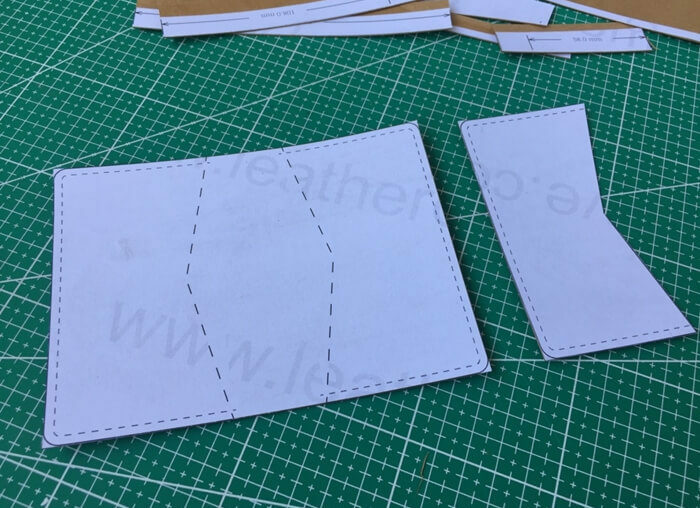 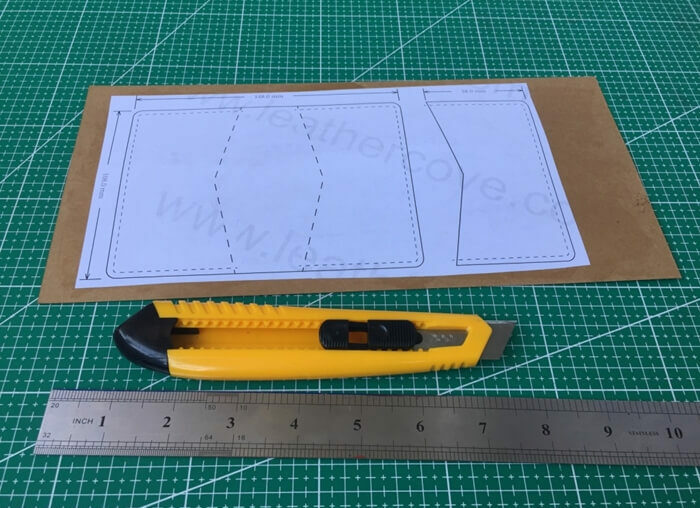 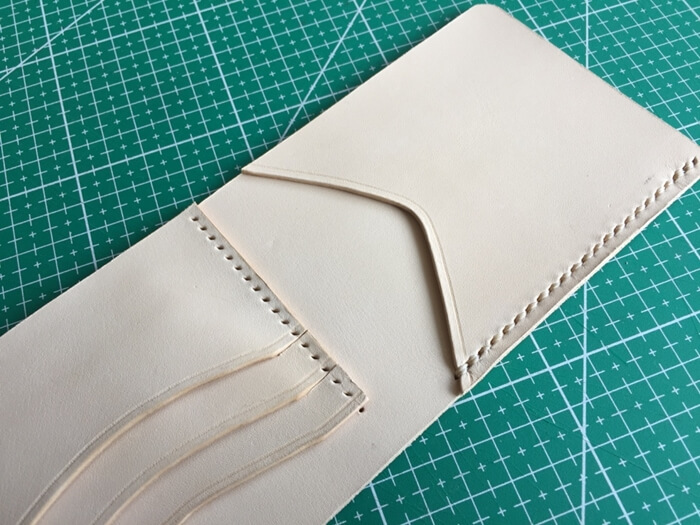 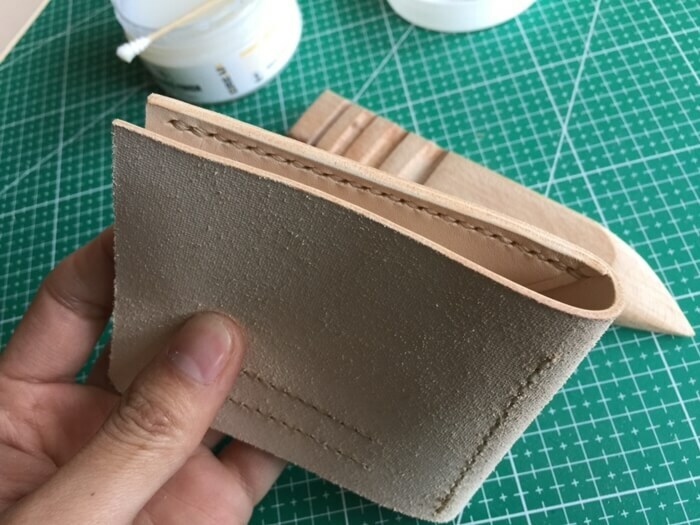 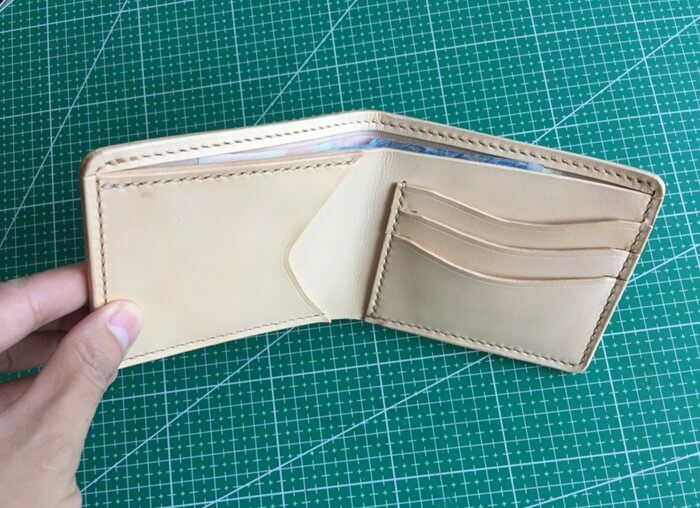 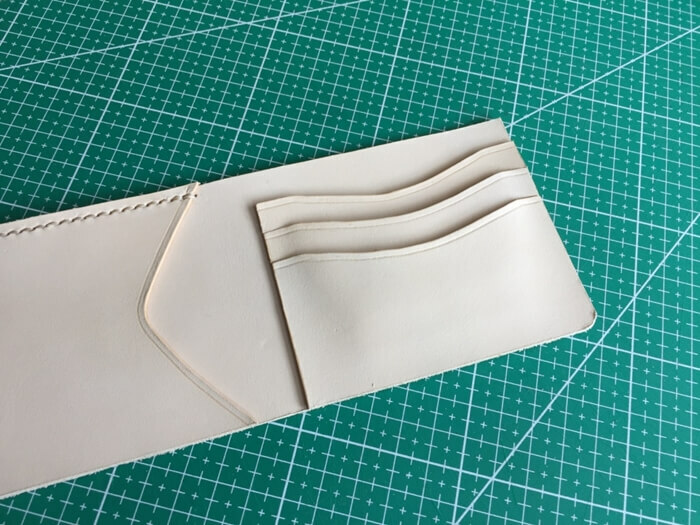 PS: We are using a card wallet pattern in the tutorial, it has 3 flaps but we no need to make all the 3 since the flap’s shapes & sizes are the same. 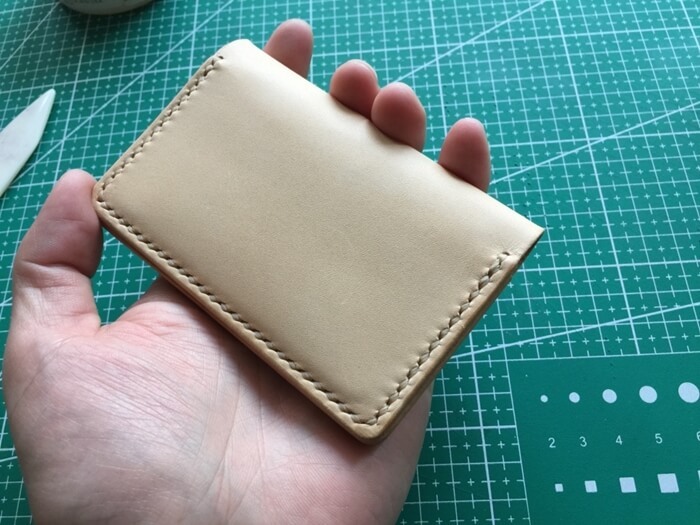 And if you like this style, click here to download.